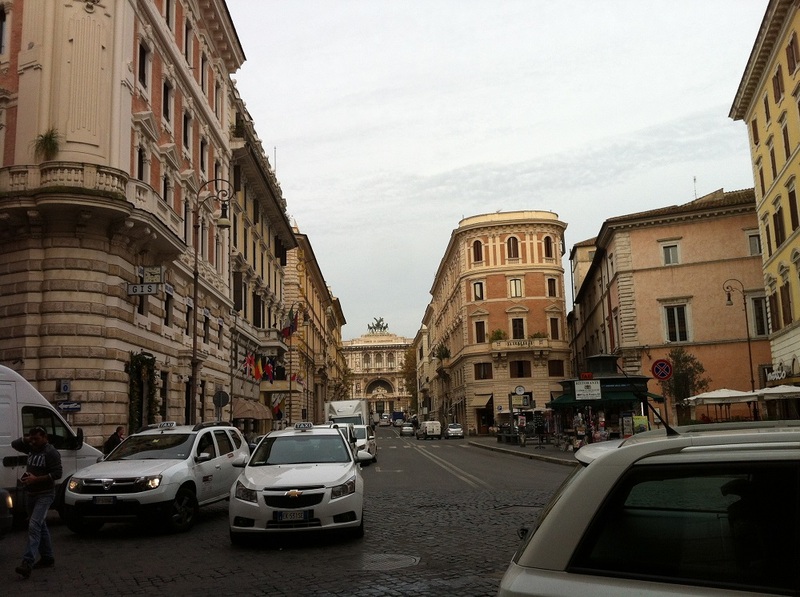 This is Rome and this is the centre of the Roman Empire. Walking around Rome is like walking in history, depending on when you want it to be: 2000 years ago or at the Renaissance time; every corner and every breath, you will be surrounded by marvellous history. 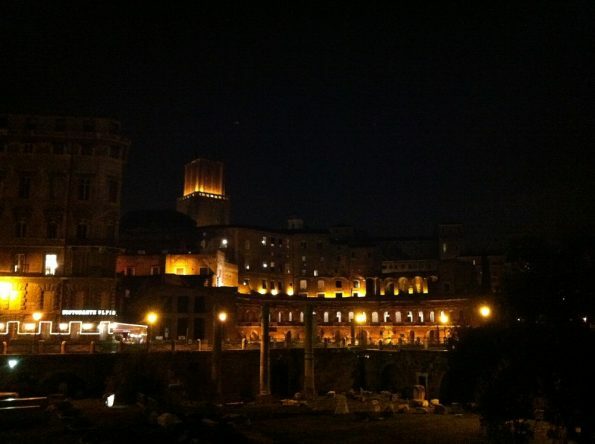 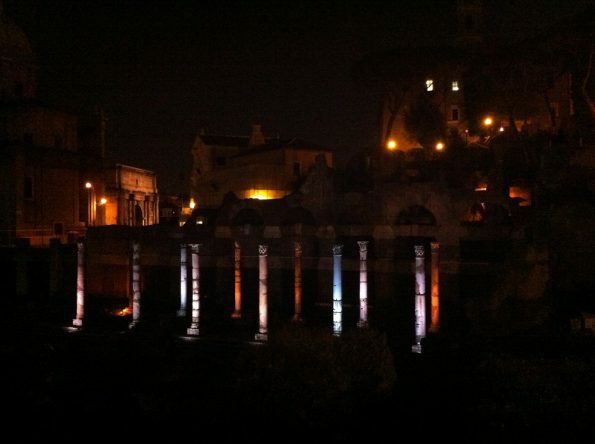 Let me first take you to the Roman Forum or Forum Romanum as they say in Roman times. 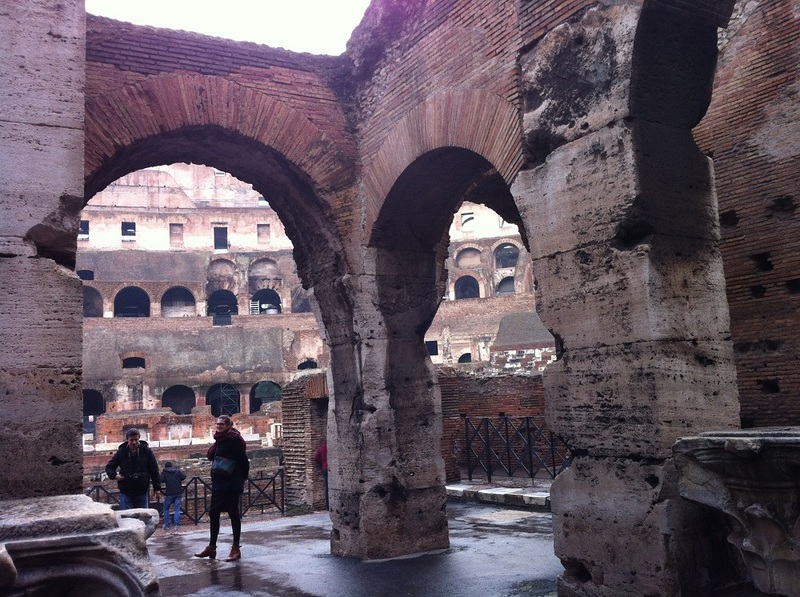 This forum alone serves complex temples and columns dedicated to various Emperors. I found it hard even to identify some of the pictures I have taken. Does this temple belong to Emperor Trajan? 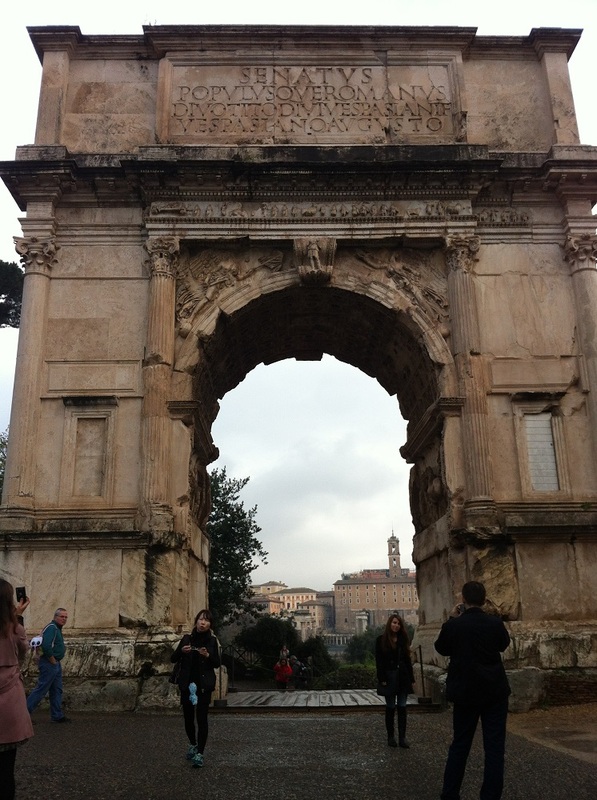 Or Emperor Vespasian? Or does it belong to Julius Caesar, the dictator general who demolished the Roman Republic and thus creating the beginning of the mightiest Roman Empire? 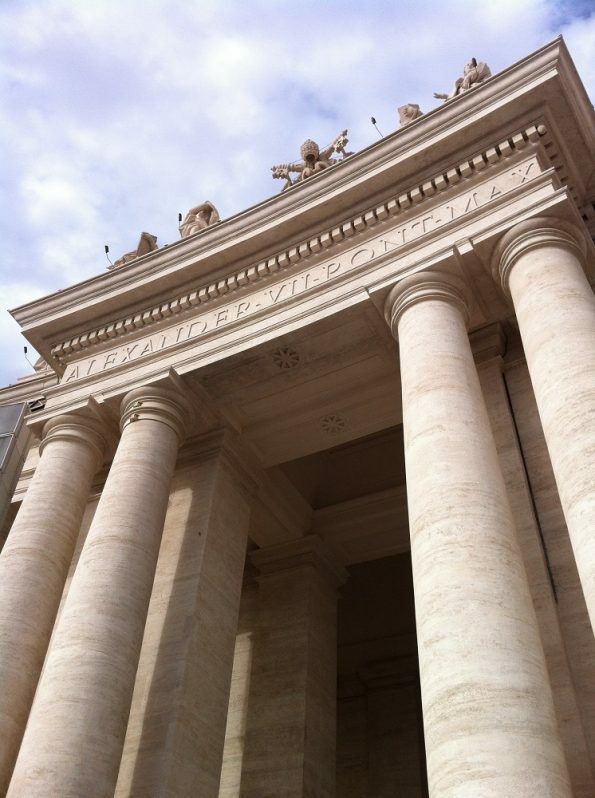 Identifying the Column below, for example, I have to ask my husband which Emperor this tall Column belongs to? 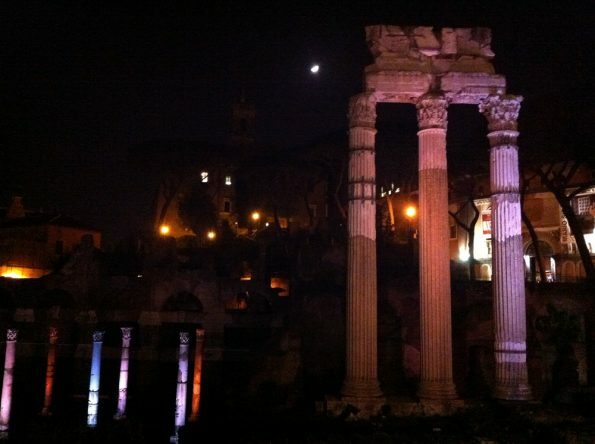 and how about the column ruins in front of it? 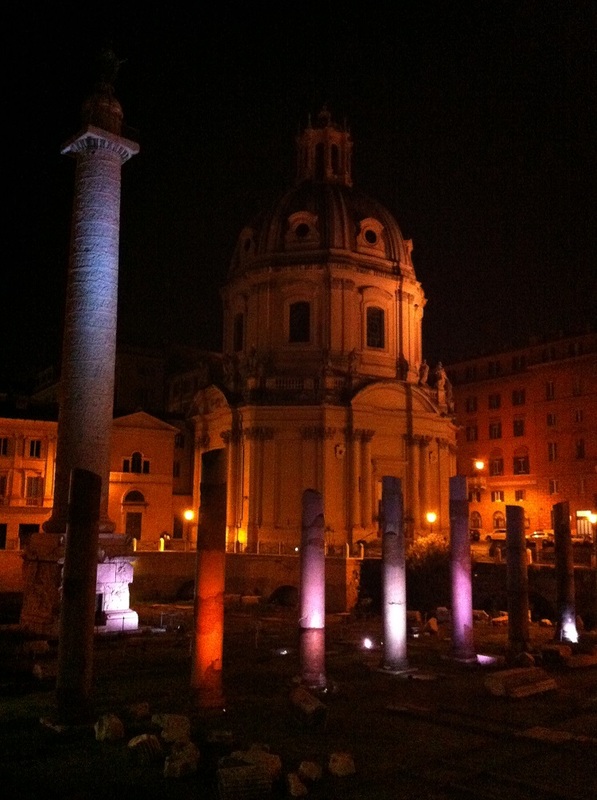 This is the Trajan’s Column, he said. 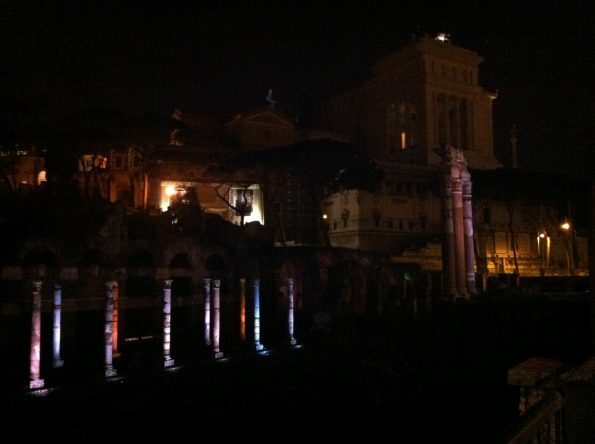 And so we assume the ruins in front of it belongs to Trajan’s forum. 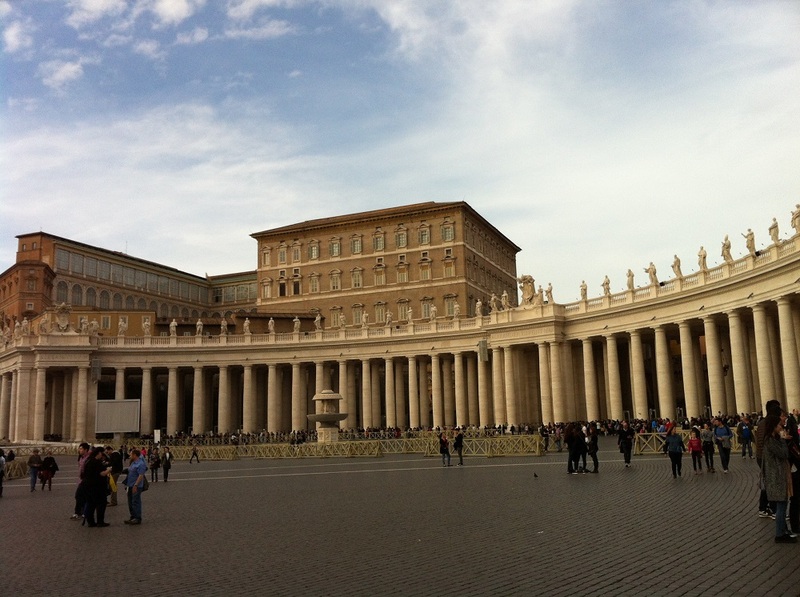 How about this Temple with three pillars below? 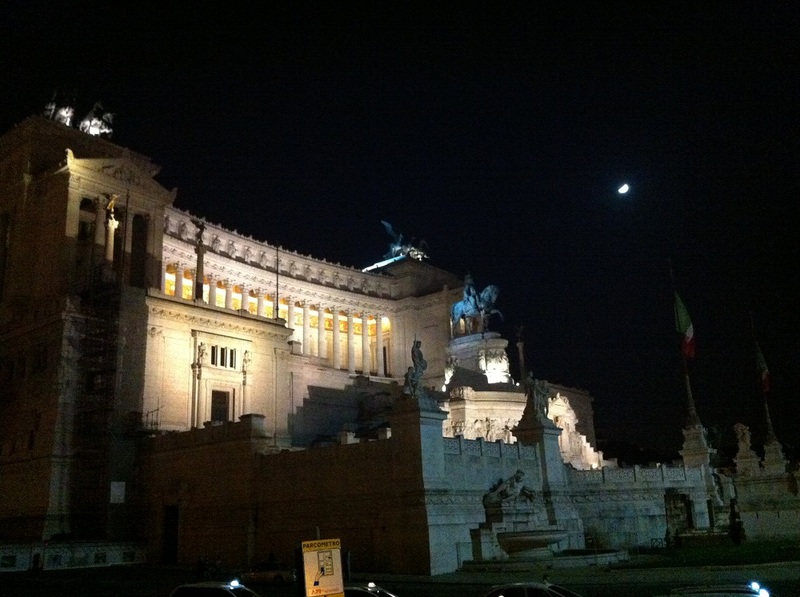 Which Emperor does this Temple belong to? 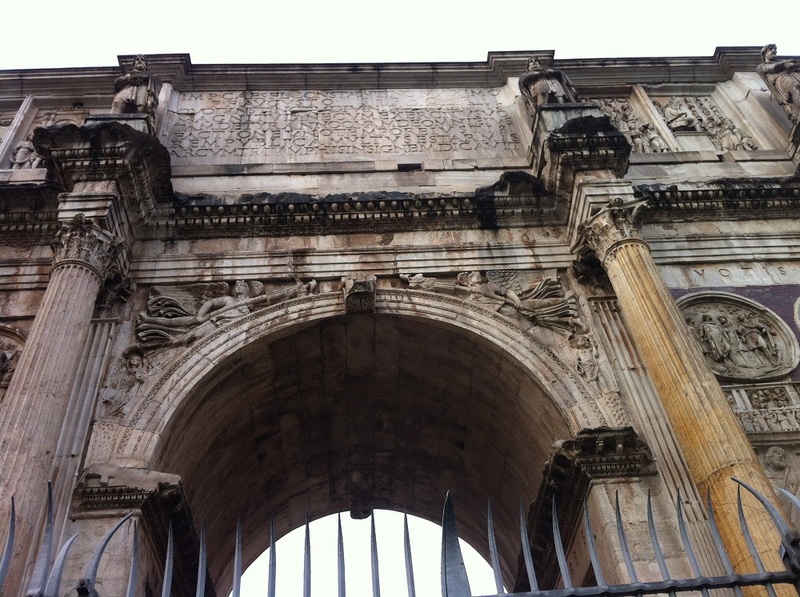 After doing some research, my husband found that it is the Temple of Venus Genetrix which belongs to Julius Caesar and is dedicated to the Goddess of Venus. Therefore the columns (brightly shining in rainbow colour) closer to this Temple of Venus, we believe, belong to Caesar’s forum. 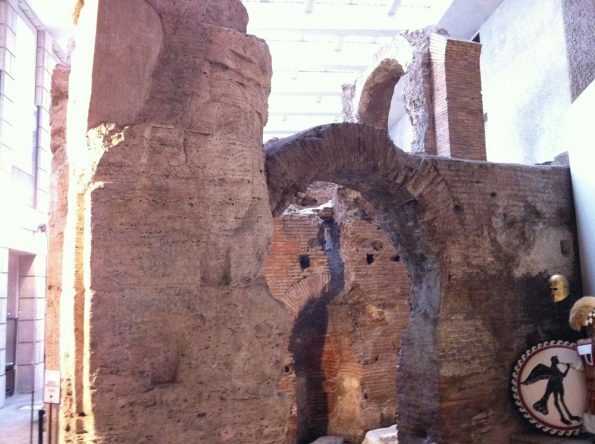 In the Forum Romanum, there are also Roman arches. The arch below, I believe, is the Arch of Titus. And closer to the Colosseum, there is another arch, which belongs to Emperor Constantine. It did say on top of the Arch: ‘IMP CAES FL CONSTANTINO MAXIMO’. 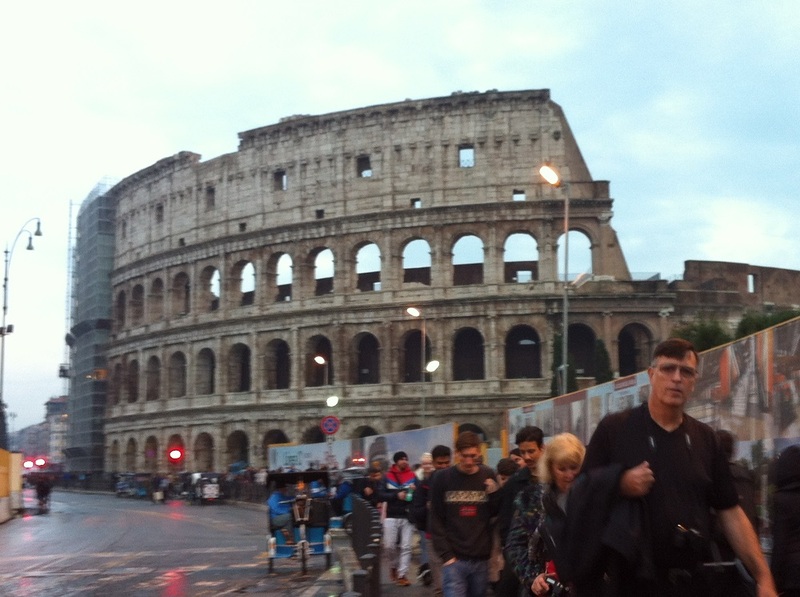 And then finally the great Colosseum stands firm there not far from the Arch of Constantine. 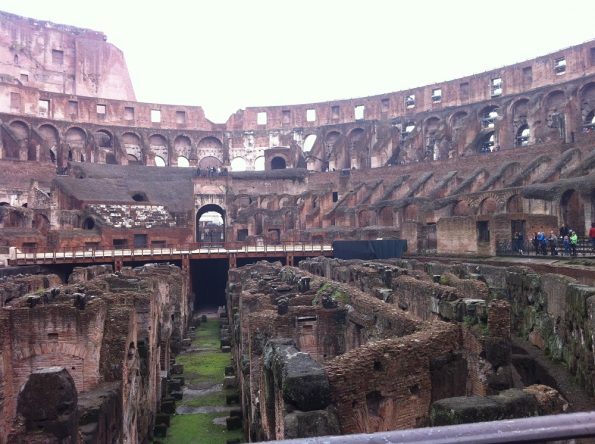 It is amazing to think that there are 230 amphitheatres that have been found across the Roman Empire. 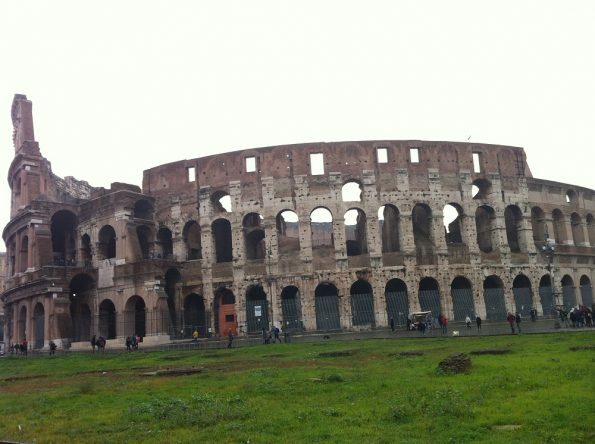 When I was a kid and being told of Colosseum as a wonder of the world, I thought it is the one and only amphitheatre of its kind. I am very surprised to find that there are a couple of hundred more amphitheatres in this world. What a mighty powerful Empire, the Roman is! 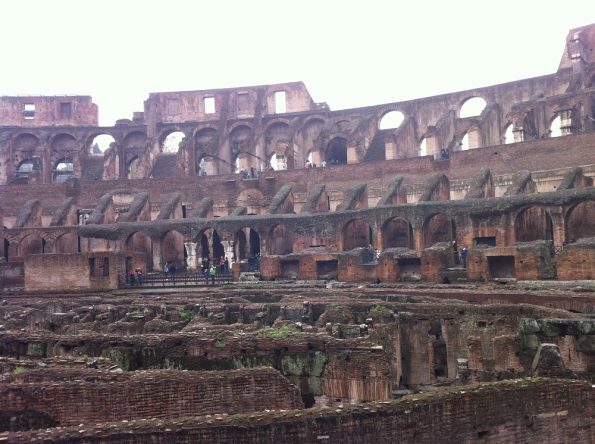 The Colosseum from the other angle, you can see there are four floors. Colosseum has three floors of arcades and is being topped by the fourth floor which exists without the arches. Unlike some amphitheatres, the base ground of Colosseum is not flat. I am not sure why, is it just because the flat floor has long gone so what we see now is just the place for them to keep the animals? 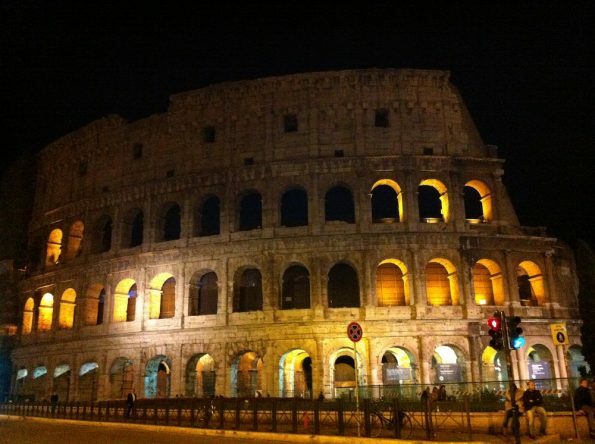 It is quite mesmerising to stand watching the Colosseum at night. Don’t forget also to visit the Imperial Palace at the Palatine Hill. 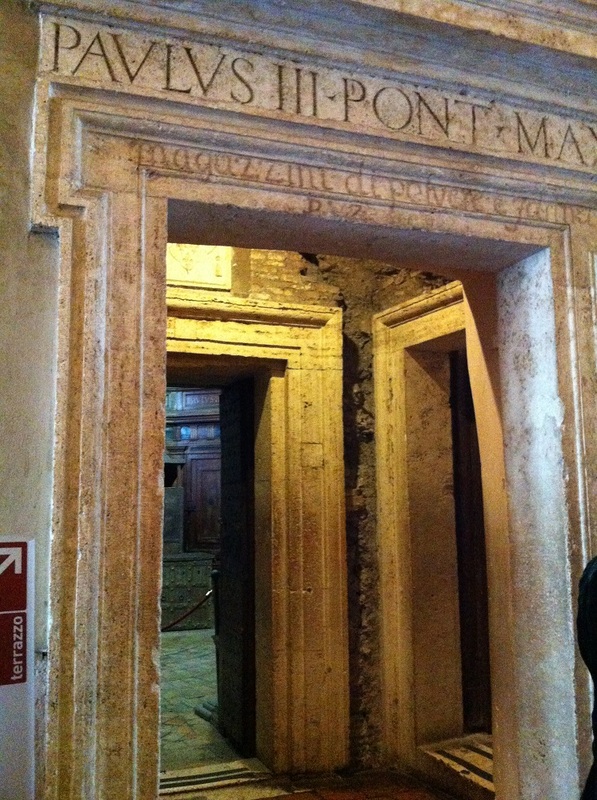 Again various Emperors has lived there, for as long as the first Emperor Augustus. One should not miss Pantheon as a great Roman Temple. 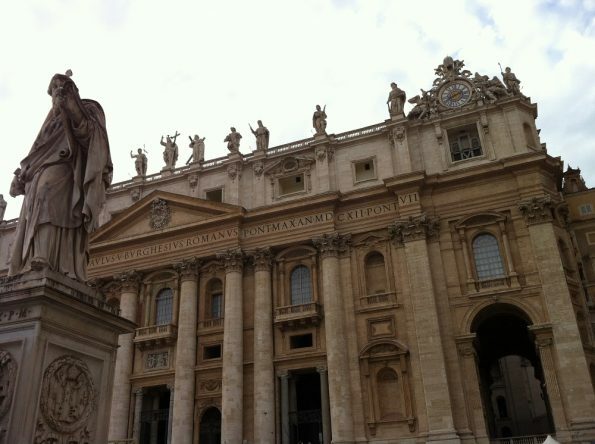 It is dedicated to all the gods. 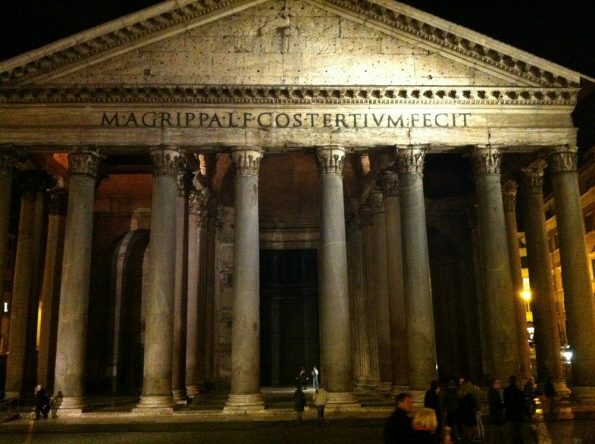 The word ‘Pantheon’ comes from Greek which means all gods. 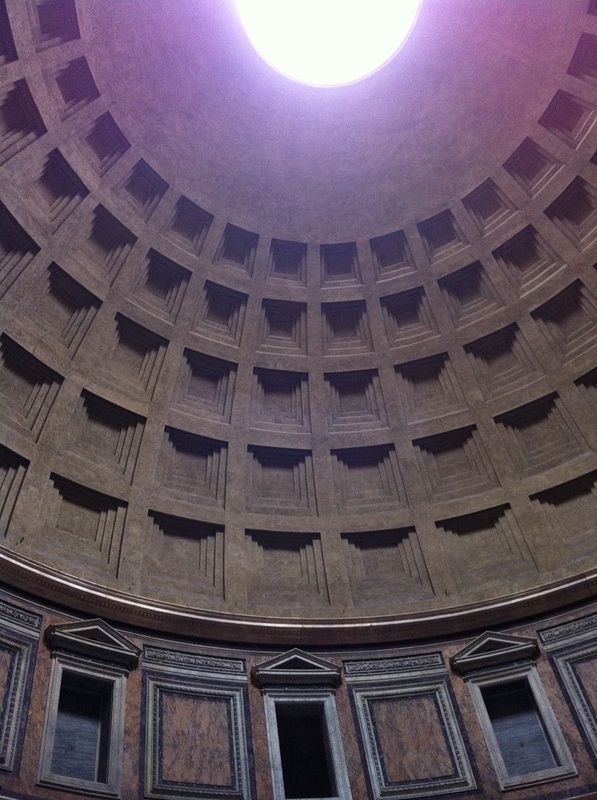 The research says that the Pantheon dome is the largest unsupported dome on earth. 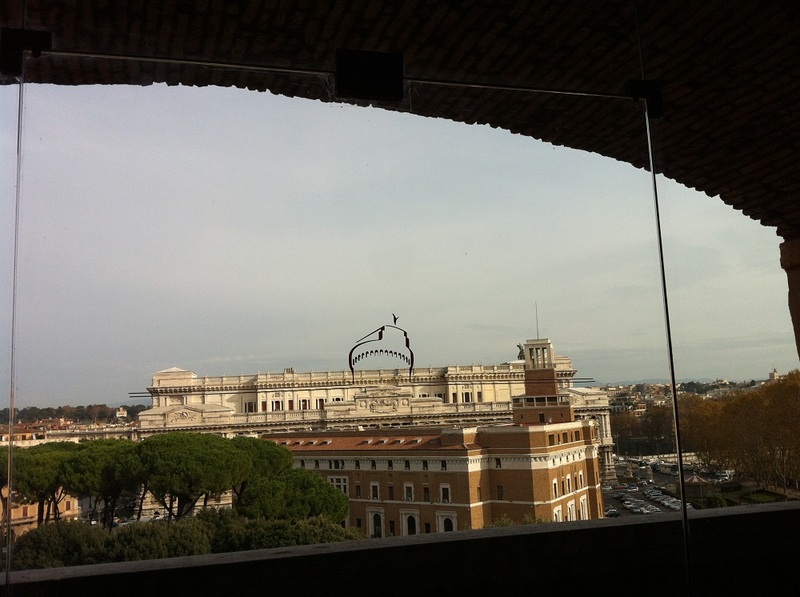 It is amazing to think at the dome architecture. 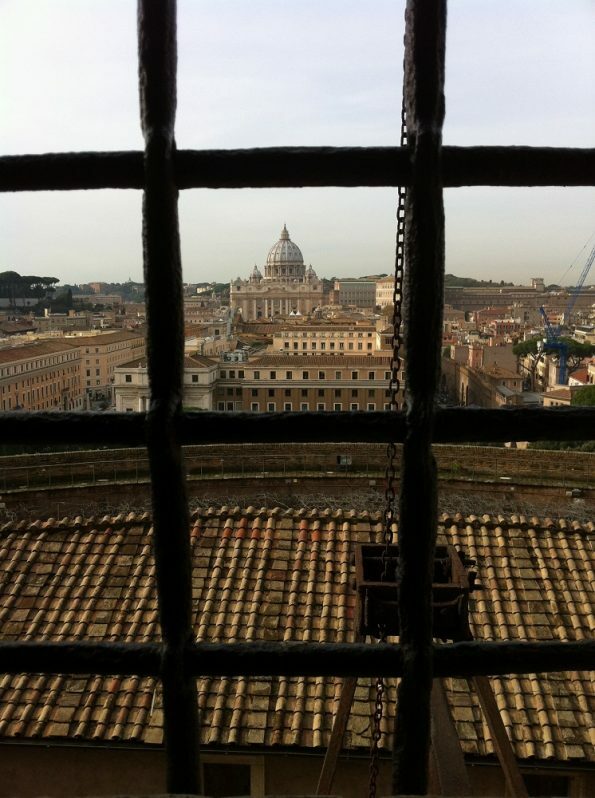 Would the hole on the top of the dome represents the sun? or would it be translated as: your prayers to gods may be heard as they go to the high sky? 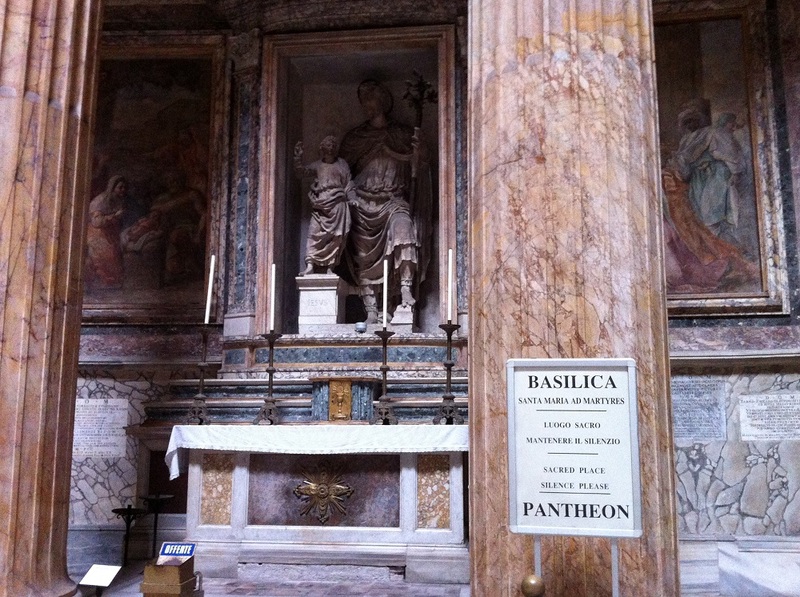 Now Pantheon is served as a Church. It is the Basilica of St. Mary and the Martyrs. There is a large painting of the Assumption of Our Lady inside the Pantheon. 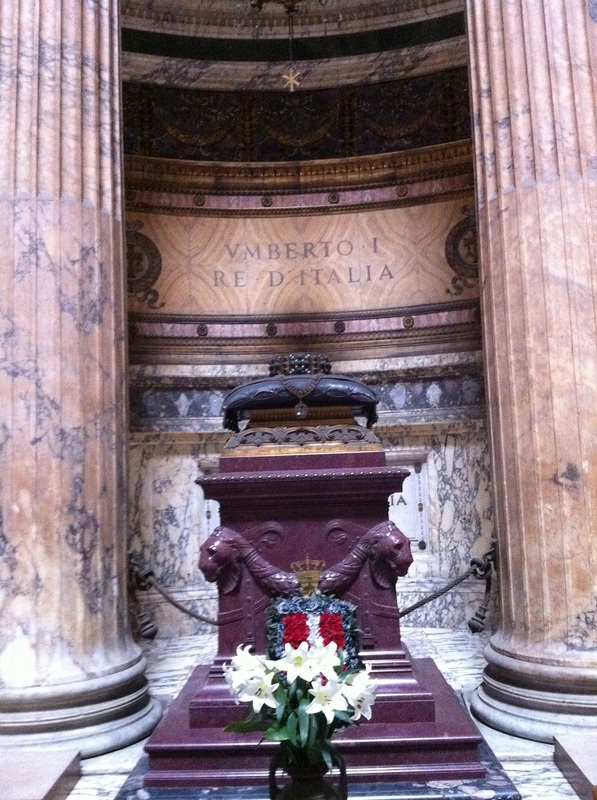 There is also the tomb of King Umberto I of Italy, inside the Pantheon. Try to see the Pantheon at night. 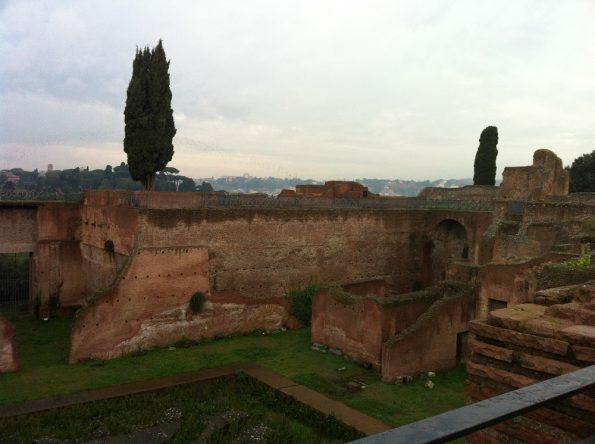 Sometimes you can feel the eery feeling imagining yourself into it in the Roman times. 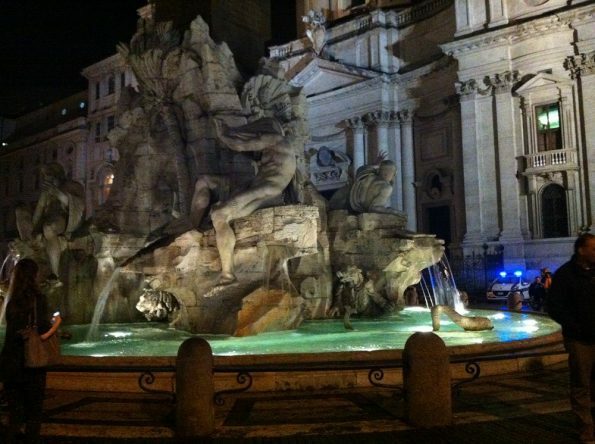 On Piazza della Rotonda, the main square of Pantheon, there is a beautiful Pantheon fountain. 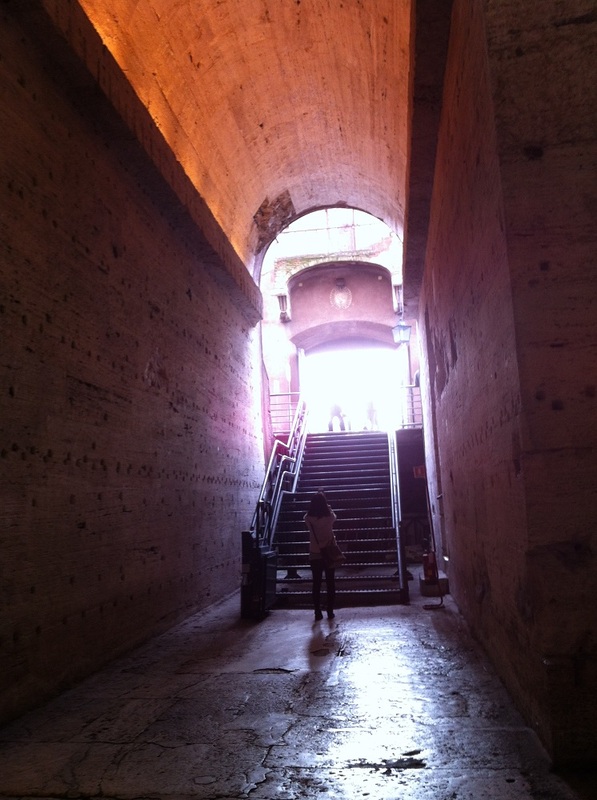 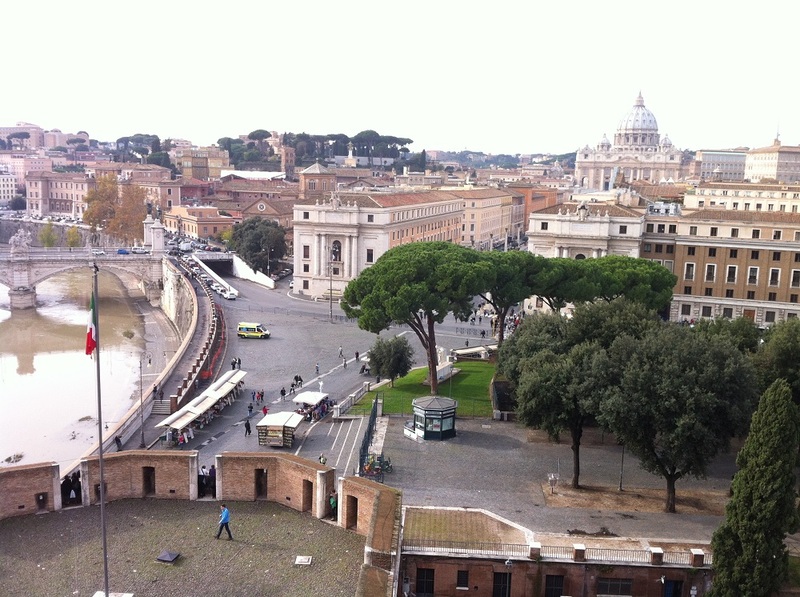 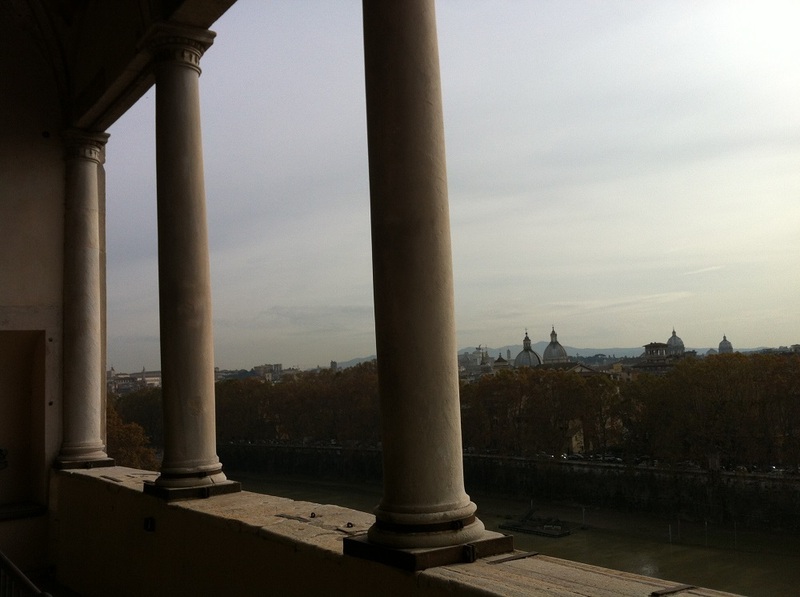 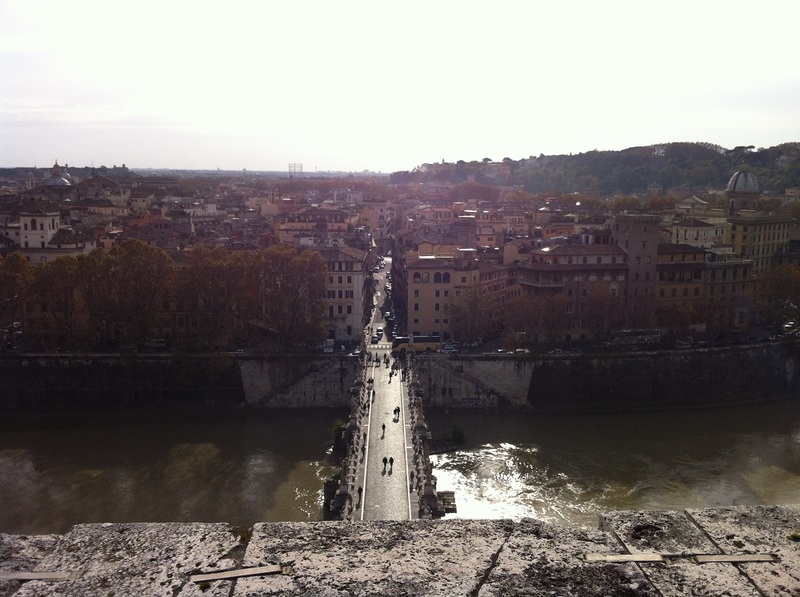 One should also not miss Castel Sant’ Angelo. 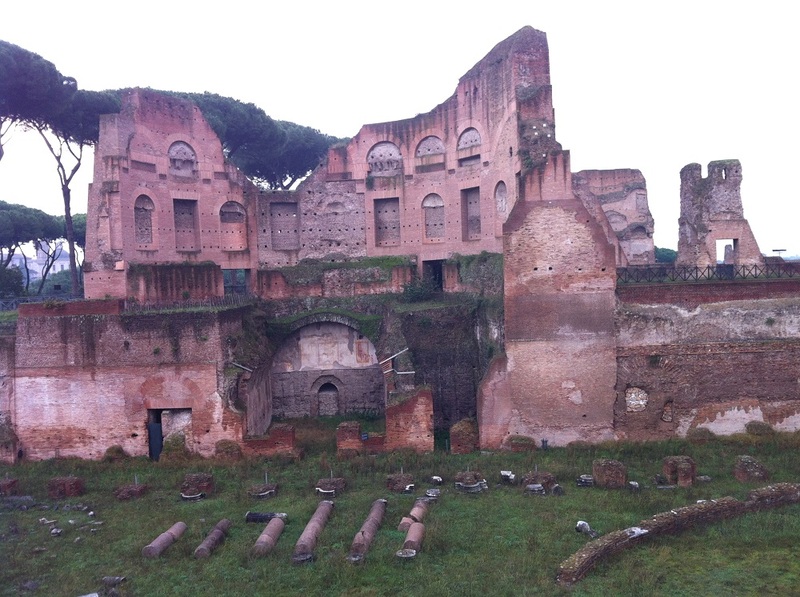 It is the burial place of several Roman Emperors. 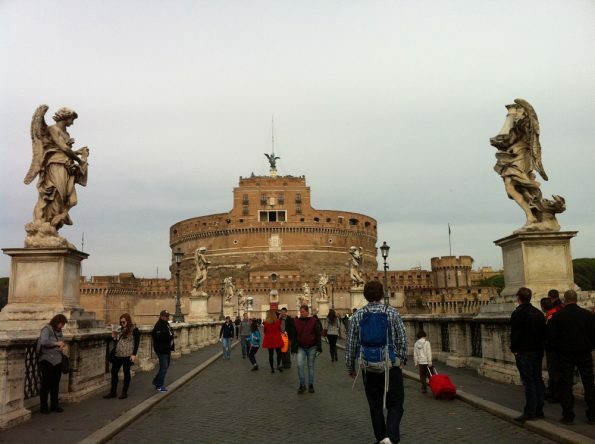 Please correct me if I am wrong: Hadrian, Antoninus Pius, Marcus Aurelius, Lucius Verus, Geta, Septimius Severus, and Caracalla were buried in Castel Sant’ Angelo. 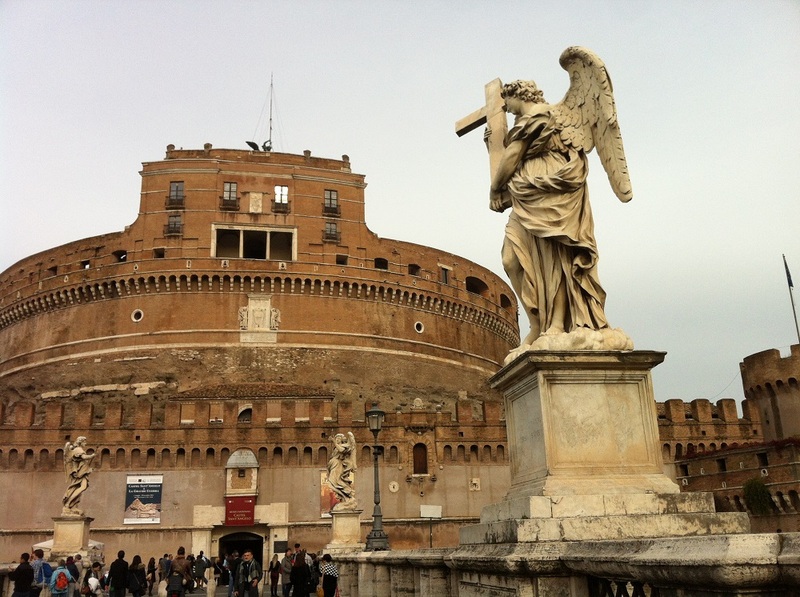 Castle Sant’Angelo is later used as a fortress. 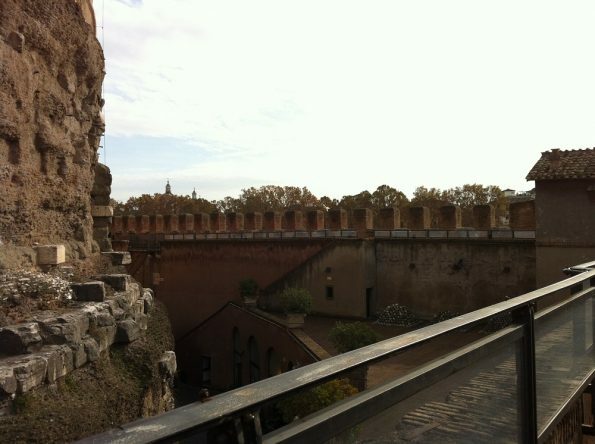 You can still see the fortification or the defensive walls of the Castle. 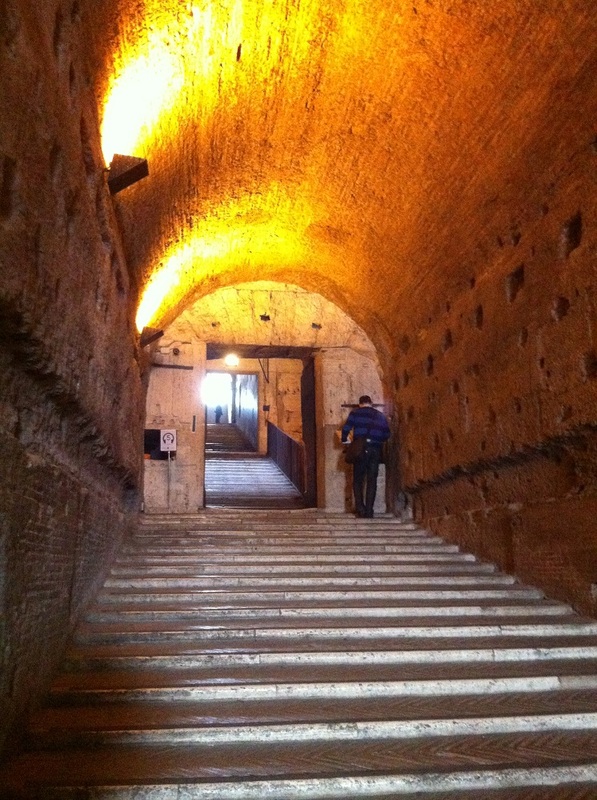 You can still see the evidence that the Castle is indeed built in Roman times. The Castle is also the residence of some Popes. You can see Pope Paulus III apartment. 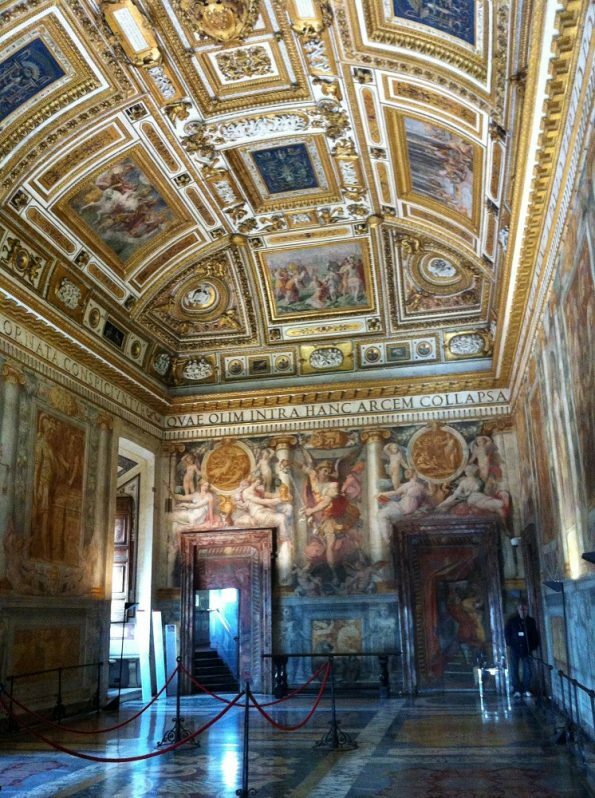 I think the ceiling with the words ‘QVAE OLIM INTRA HANC ARCEM COLLAPSA’ belongs to Pope Paul III apartment (please correct me if I am wrong). 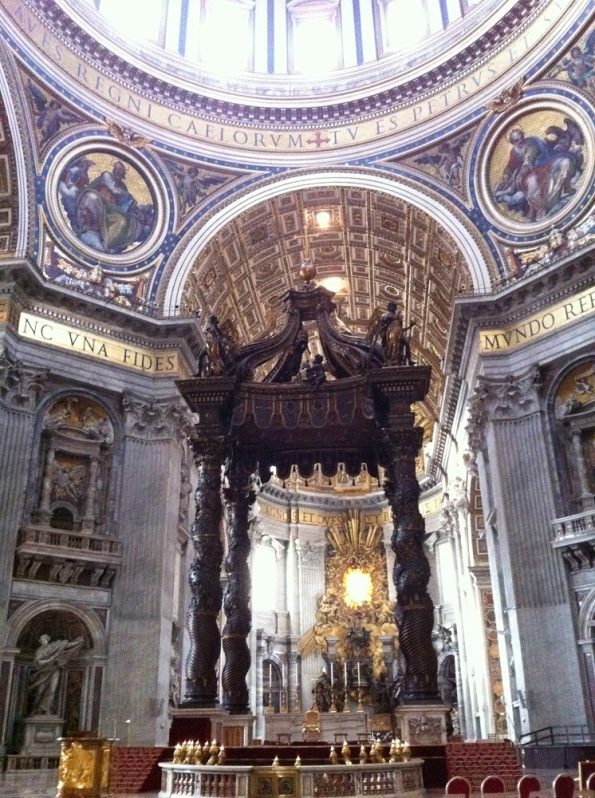 Not sure what the meaning of ‘QVAE OLIM INTRA HANC ARCEM COLLAPSA’, I think it maybe a dedication to Pope Paul III. Is that an antique piano? 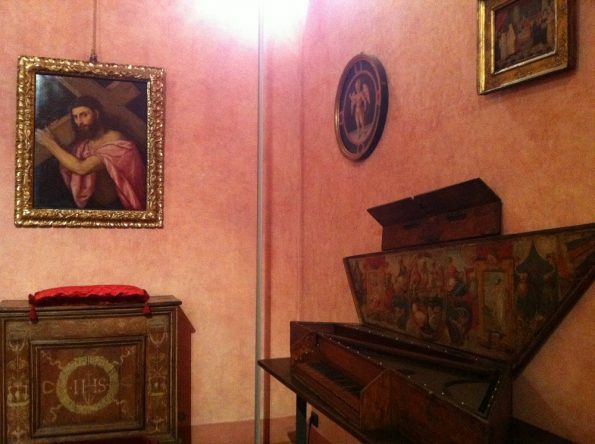 Very pretty piano with painting inside. 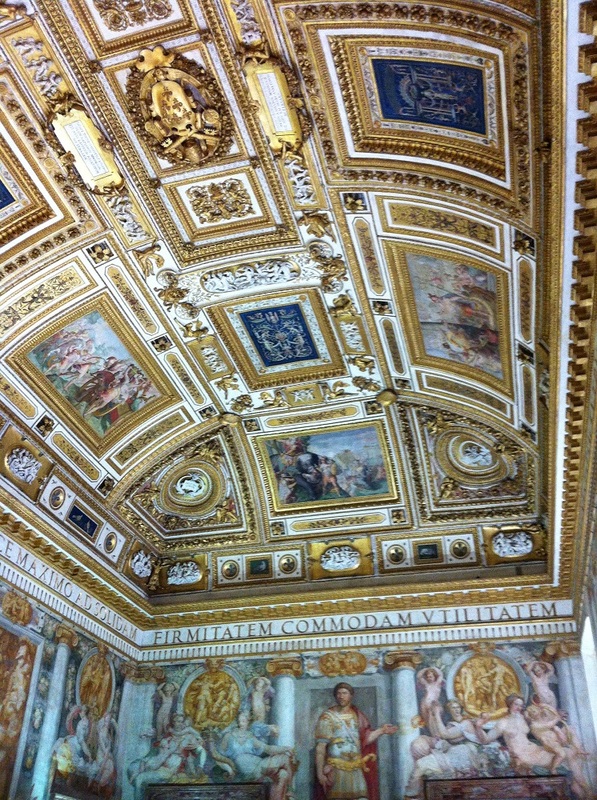 Another lovely Italian painting inside the Papal apartment. On top of Castle St Angelo there is a large bronze statue of St Michael the Archangel. 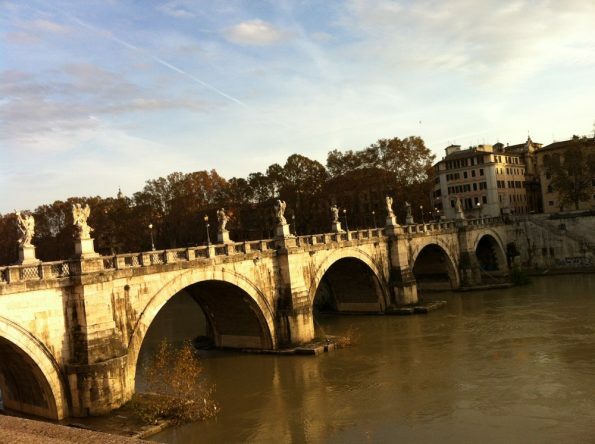 There is also a famous bridge called the Bridge of Angels or Ponte Sant’Angello which is arguably the prettiest bridge in Rome. There are ten beautiful Angels on this bridge, which were created on the 17th century by various Italian sculptors. 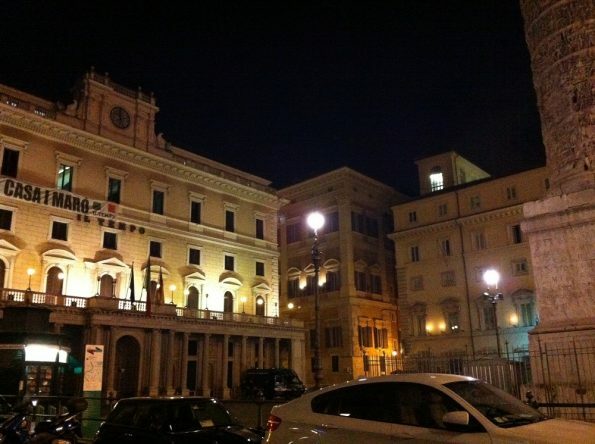 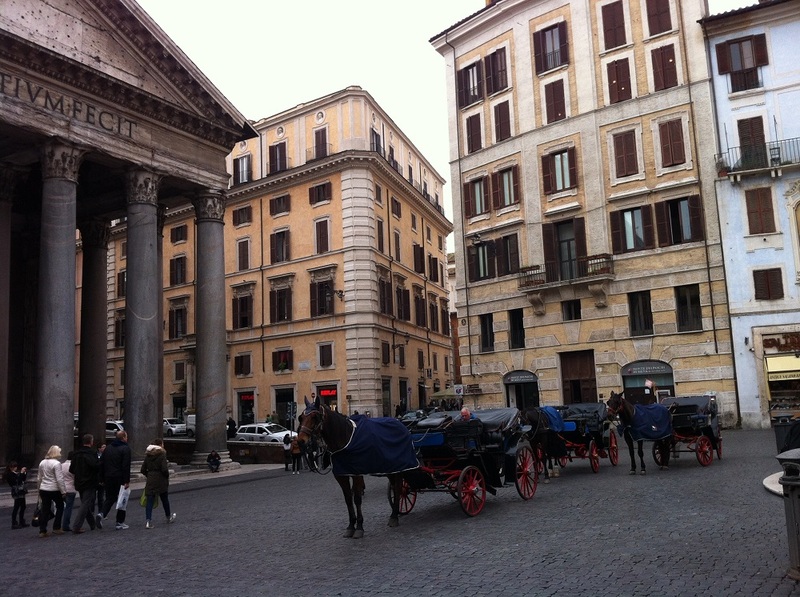 There are many beautiful piazzas in Rome. 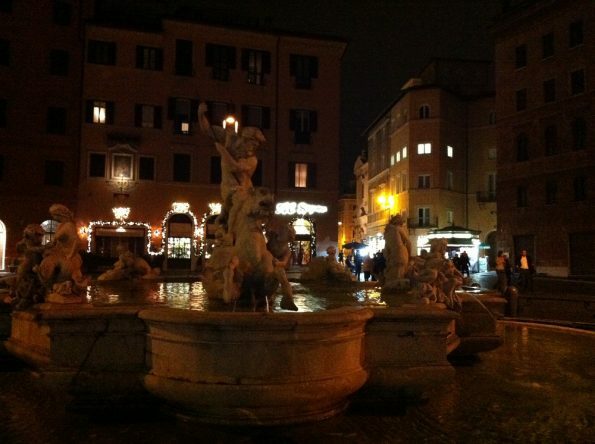 One of the famous ones is Piazza Navona. 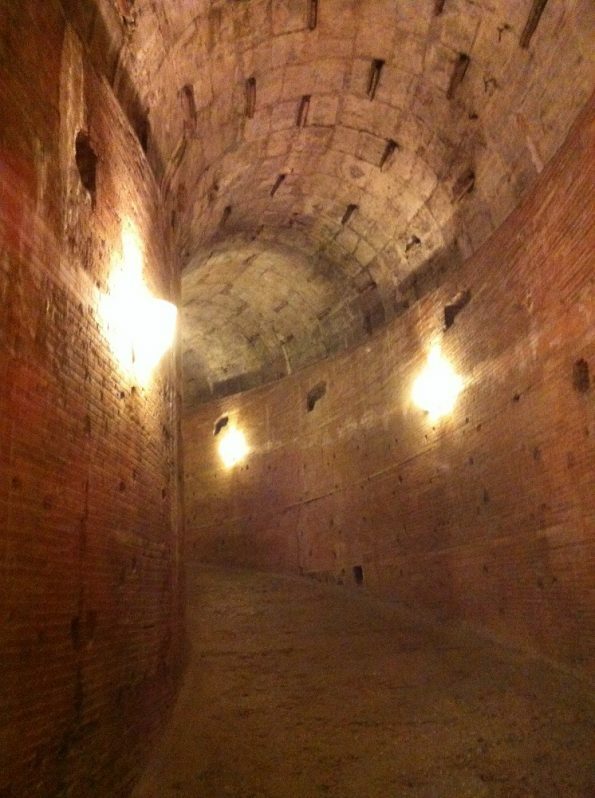 It is created on the arena of Domitian Stadium from around AD 86. 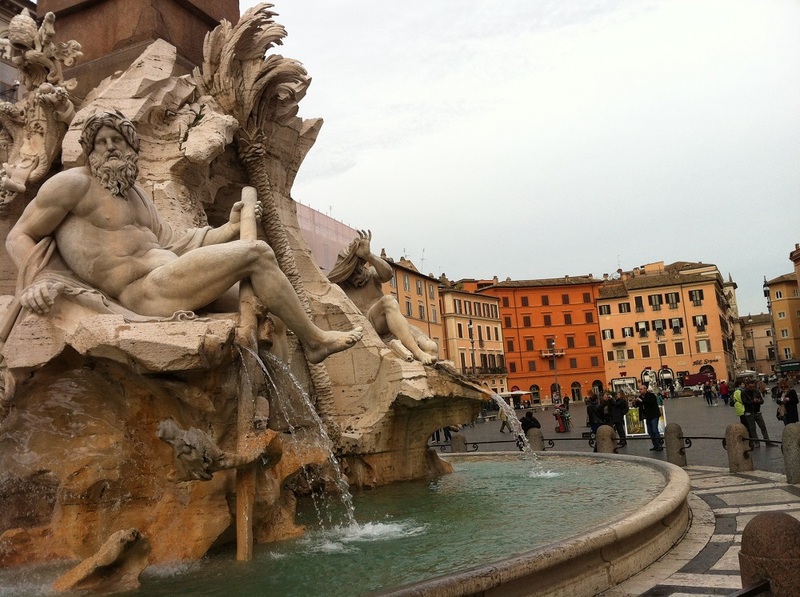 There lays a famous Bernini’s fountain with Neptune God of River statues. The Roman obelisk is present in Piazza Navona. 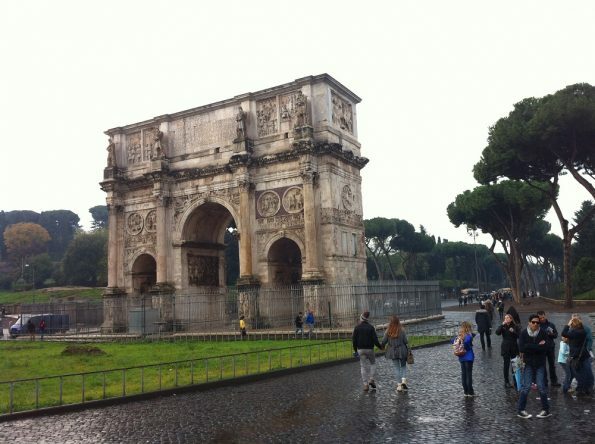 Interestingly the obelisk was made in Domitian time around 81-96 AD. 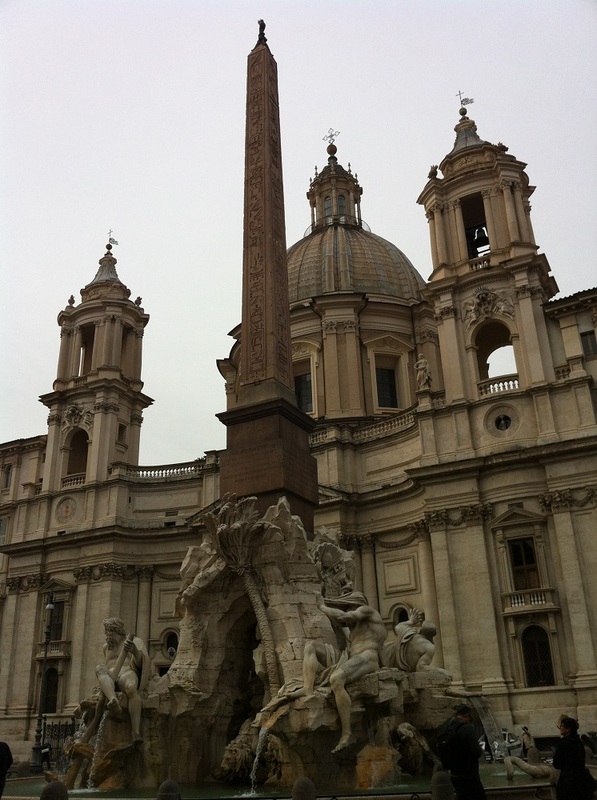 Though it was made in Egypt, it is not an ancient Egyptian obelisk. 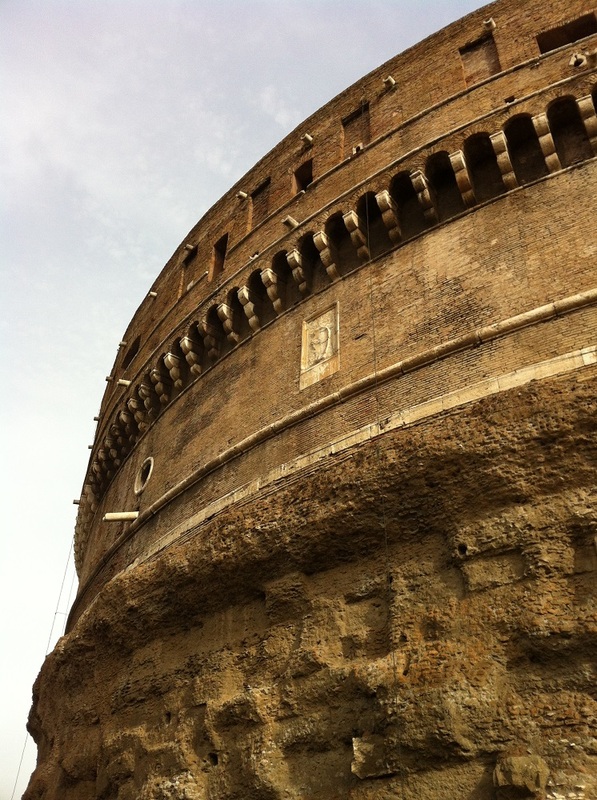 It was made by the order of Emperor Domitian. 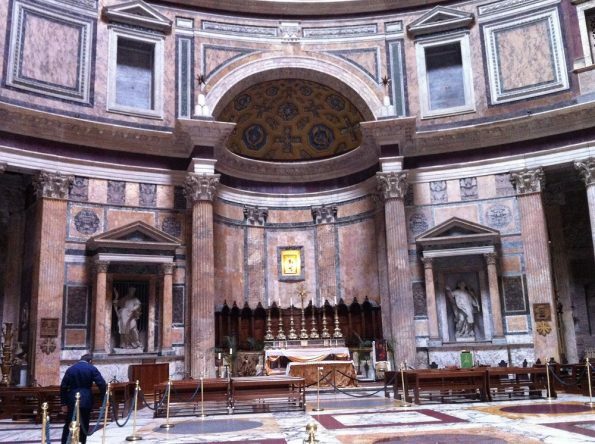 The Emperor tries to incorporates Egyptian arts into the Roman arts, according to an article from Wellesley College here. On the other side of Piazza Navona, there is a statue of Poseidon, God of sea. Not far from Piazza Navona, if you are looking at the back street, you can see the ruins of the old Domitian stadium. 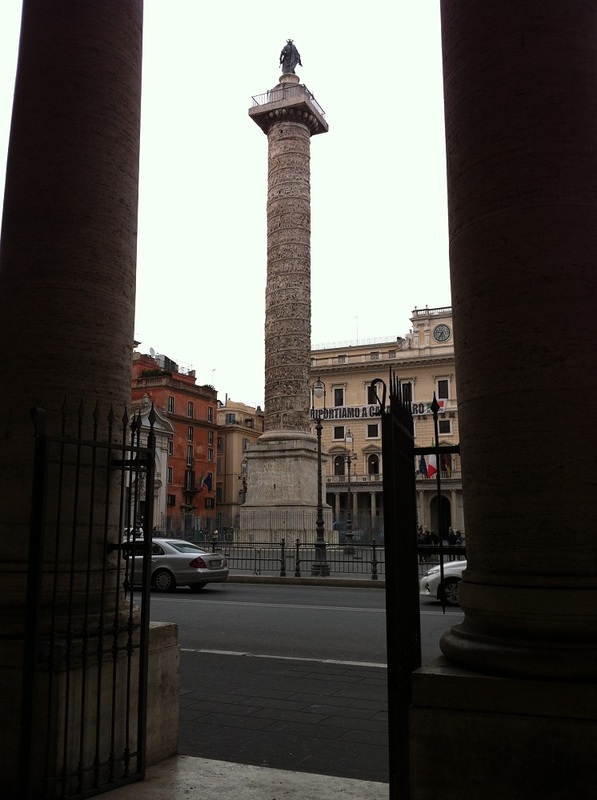 Don’t forget to visit Piazza Colonna too, where you can see the Column of Marcus Aurelius. Column of Marcus Aurelius is beautifully carved with stories of the wars during Marcus Aurelius’ reign. 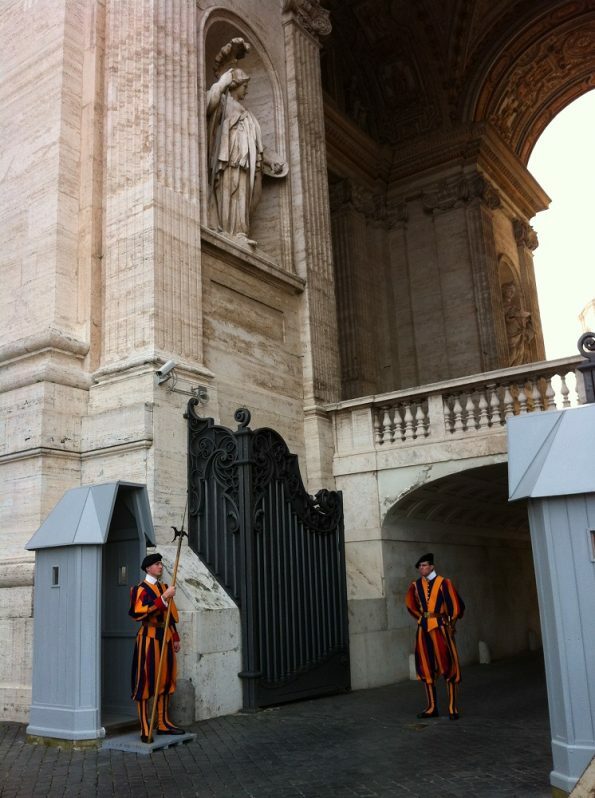 Now you are entering the perimeter of the autonomous State of Vatican City. Whether you want to see the Pope during the Papal audience or you just want to step back in Renaissance time to see the glory of Italian masterpieces, it is recommended to visit this enchanting headquarter of the Roman Catholic church. 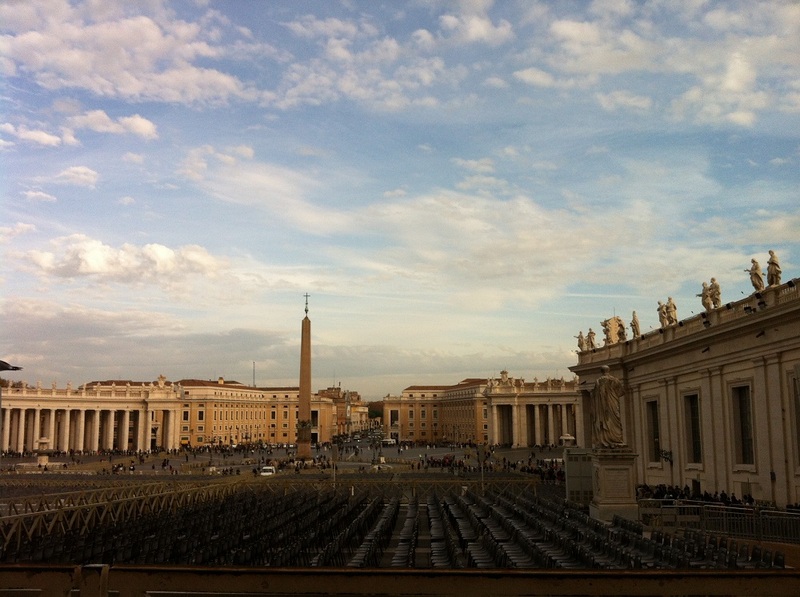 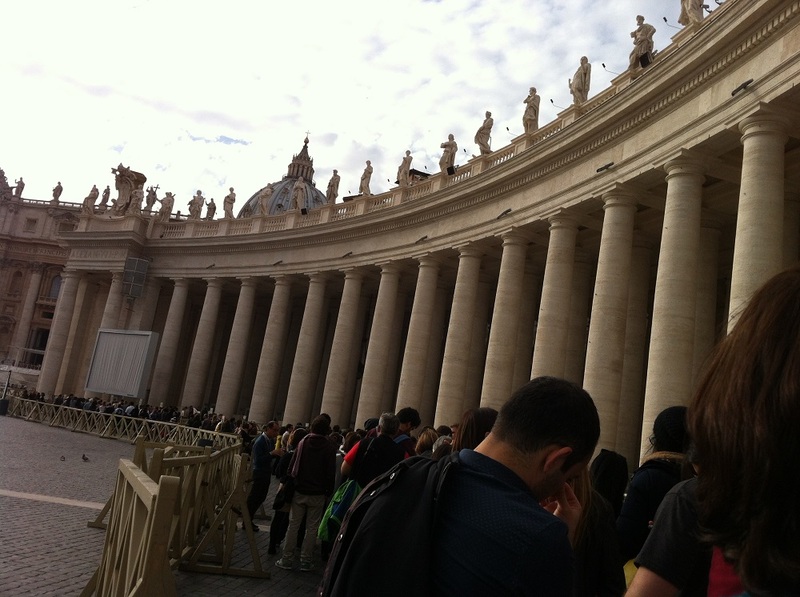 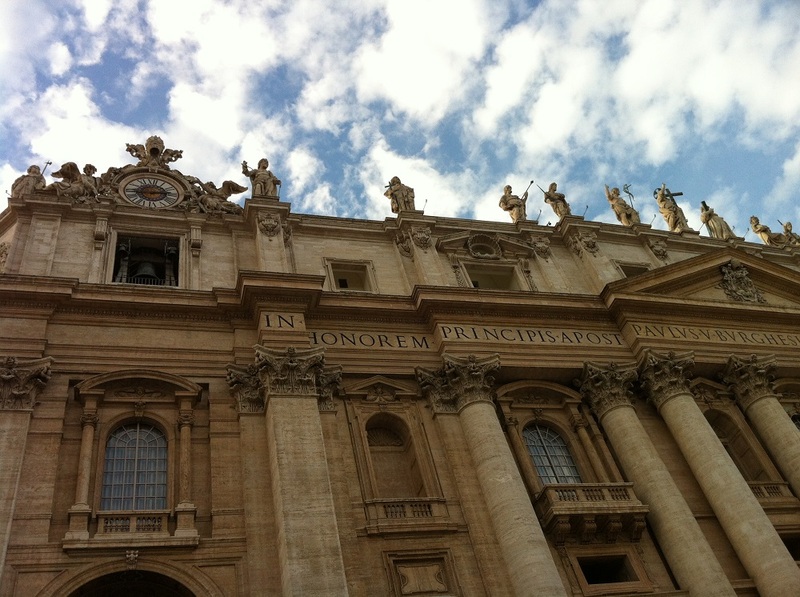 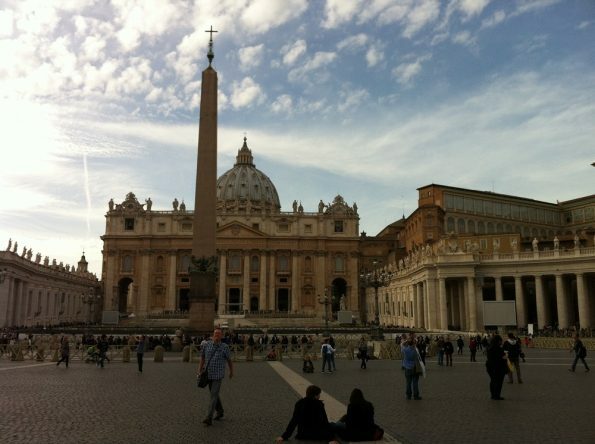 St. Peter’s Basilica is arguably the must-see place in the Vatican City. 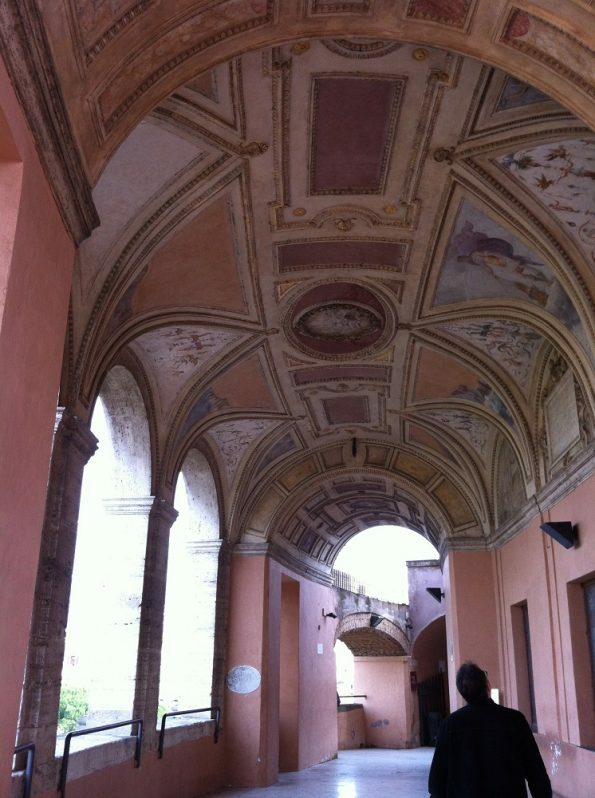 It is breathtaking to experience the remarkable example of Italian renaissance architecture. 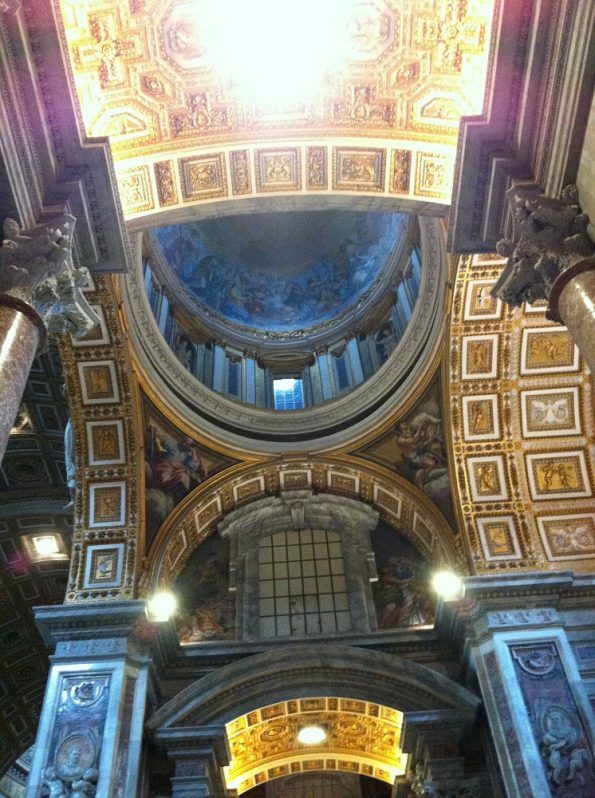 It is mesmerising to be inside St. Peter’s basilica. The dome reads ‘TV ES PETRVS ET SVPER HANC PETRAM AEDIFICABO ECCLESIAM MEAM. TIBI DABO CLAVES REGNI CAELORVM’ meaning ‘You are Peter and on this rock, I will build my Church’. 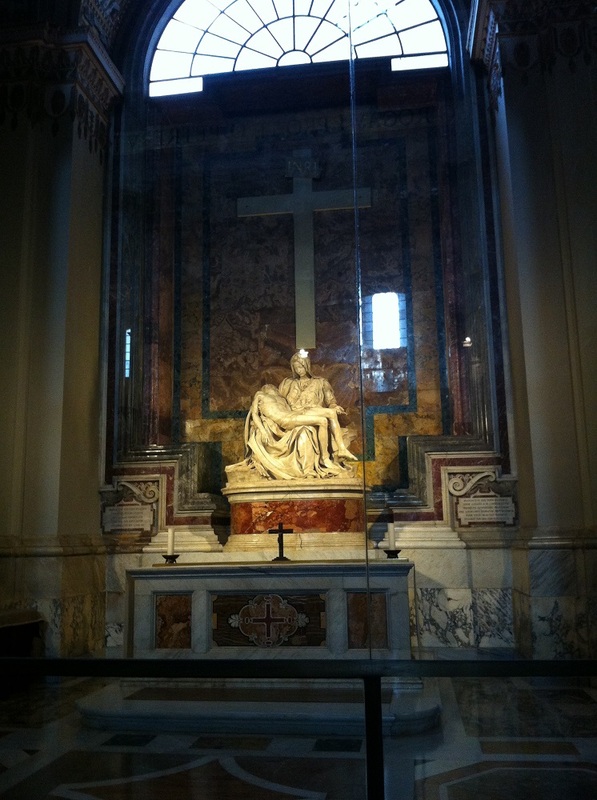 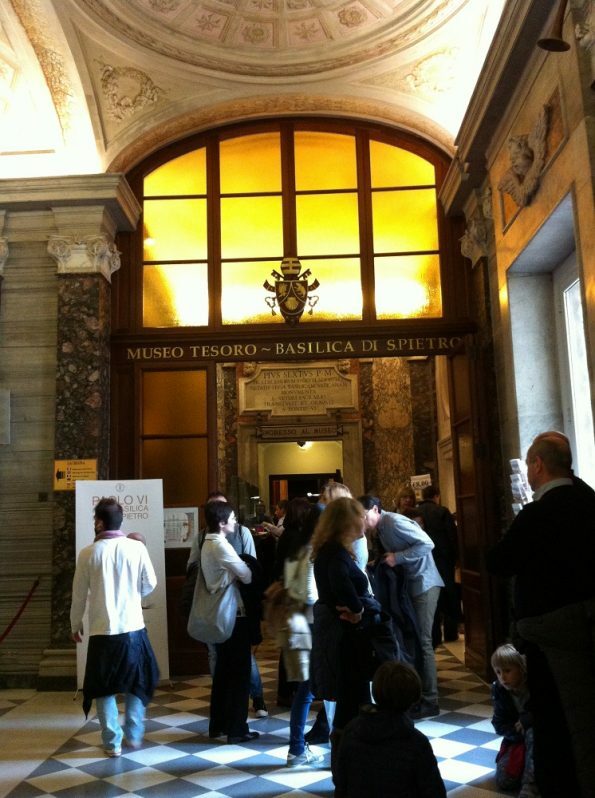 On the right hand corner near the entrance of the Basilica, you will find the famous sculpture of Michelangelo: Pietà. 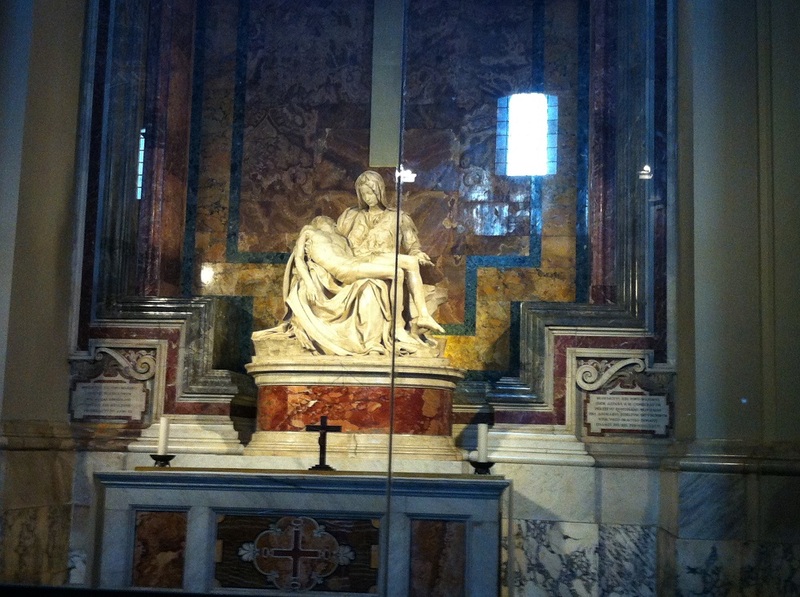 Pietà depicts Mary the Mother holding Jesus after His Crucifixion. It was made by the renaissance artist Michelangelo on 1498-1500. 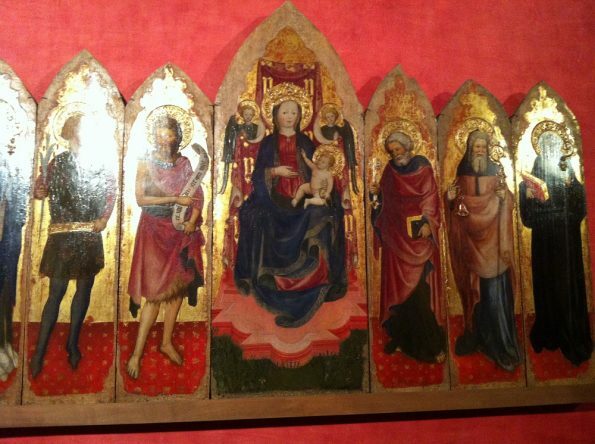 It is one of the best examples of Renaissance art that still exist today. 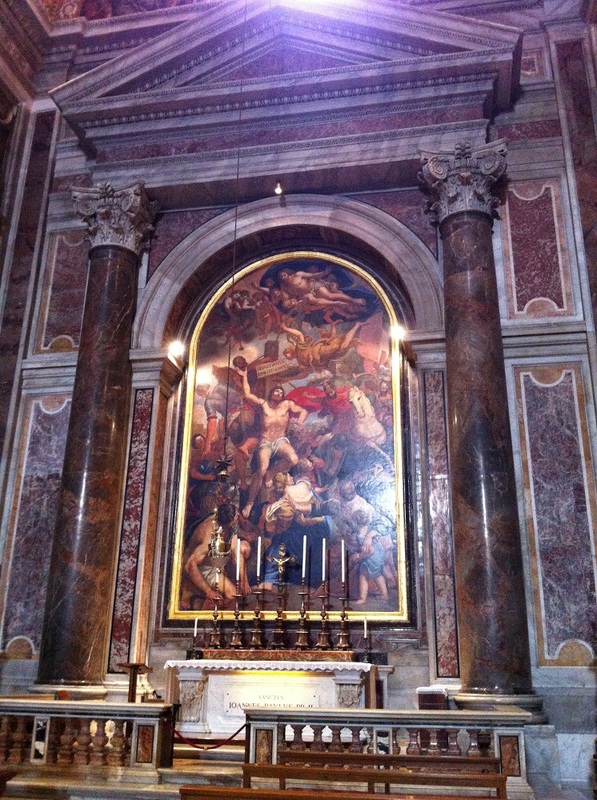 Inside the Basilica, there is St. Sebastian chapel which is dedicated to St Sebastian. 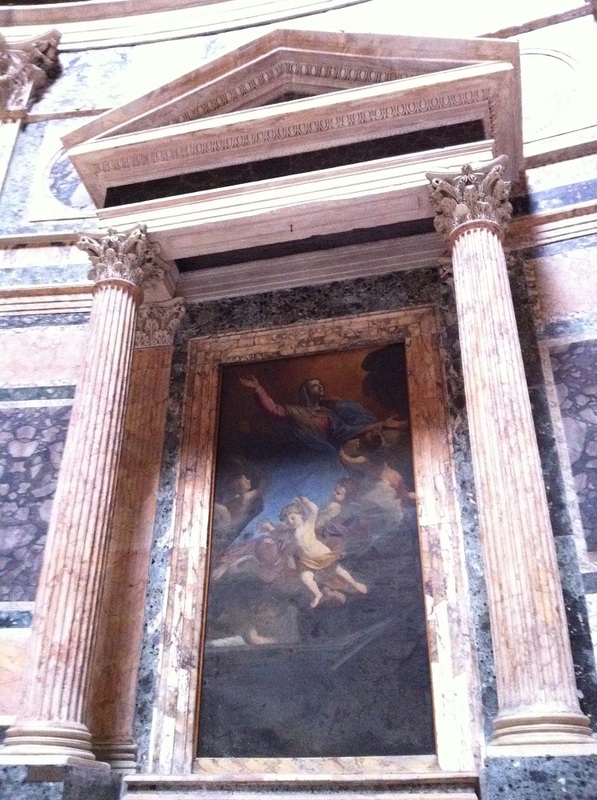 The painting reads ‘SEBASTIANVS CHRISTIANVS’. 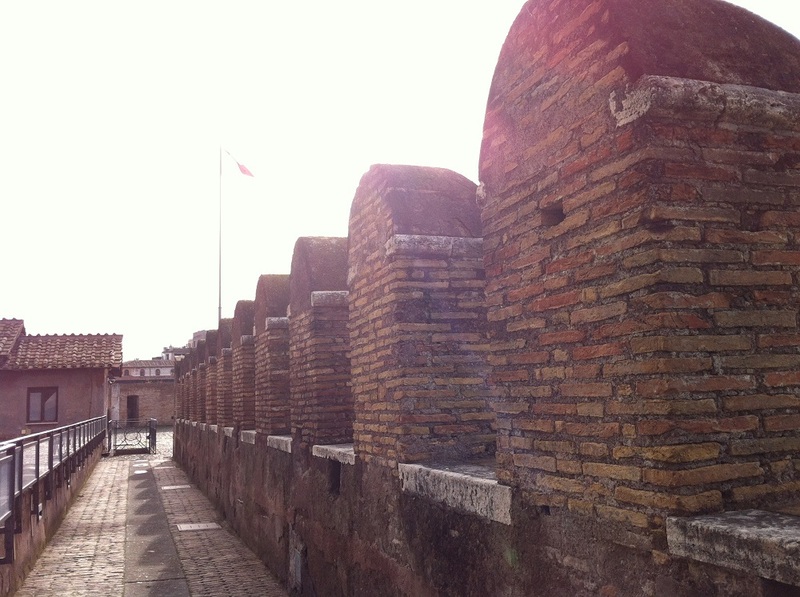 He is a martyr during the reign of Emperor Diocletian when there was a prosecution of Christians. Beneath the St. Sebastian altar, lays the remain of St. Pope John Paul II. 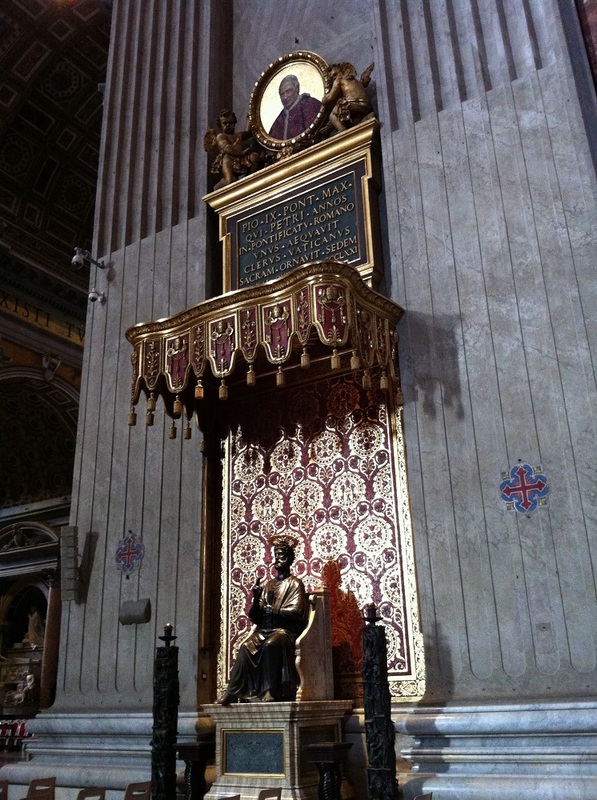 Inside the Basilica, there is also a statue of St. Peter with a writing of Pope Pius IX above it. 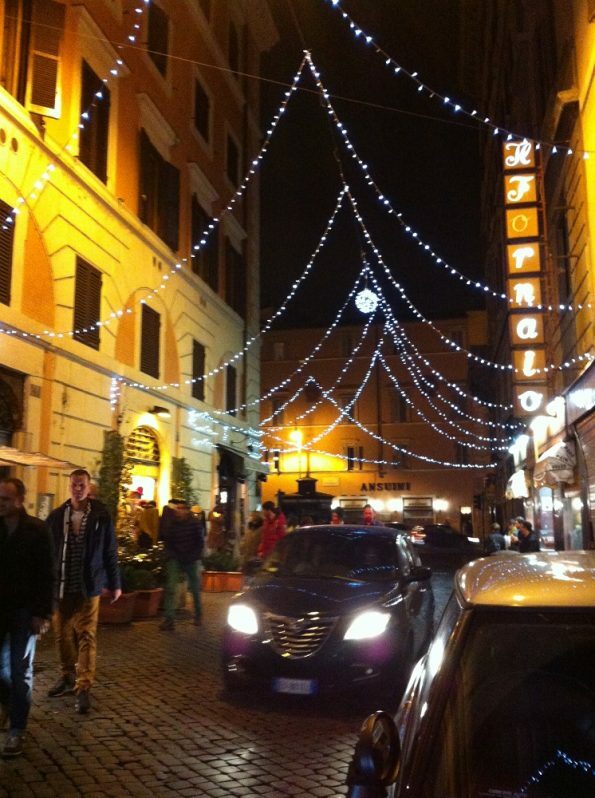 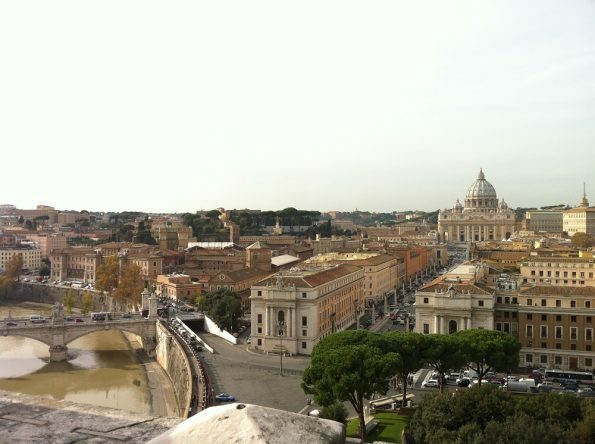 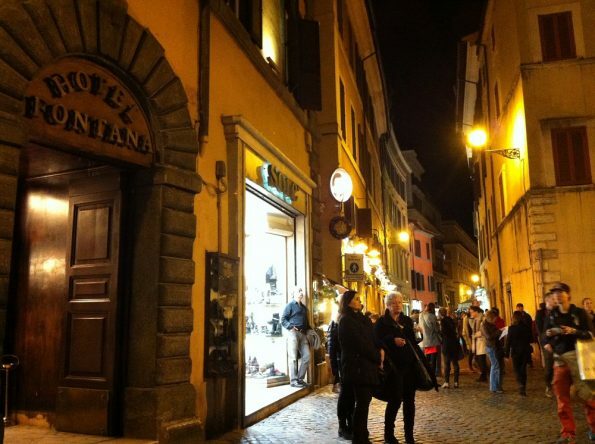 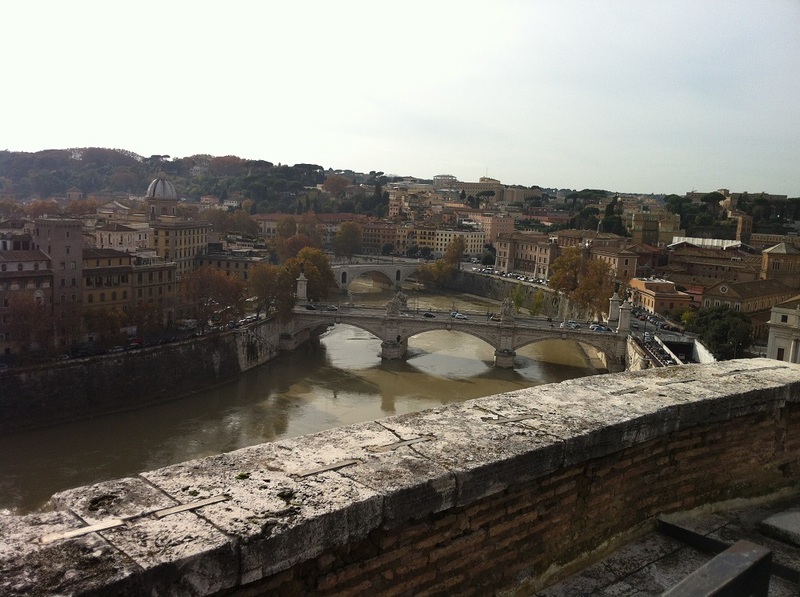 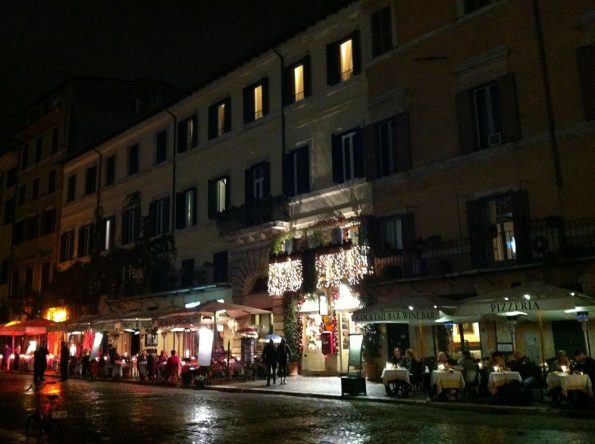 After a long day enjoying Rome, remember to enjoy Rome like the Romans do! 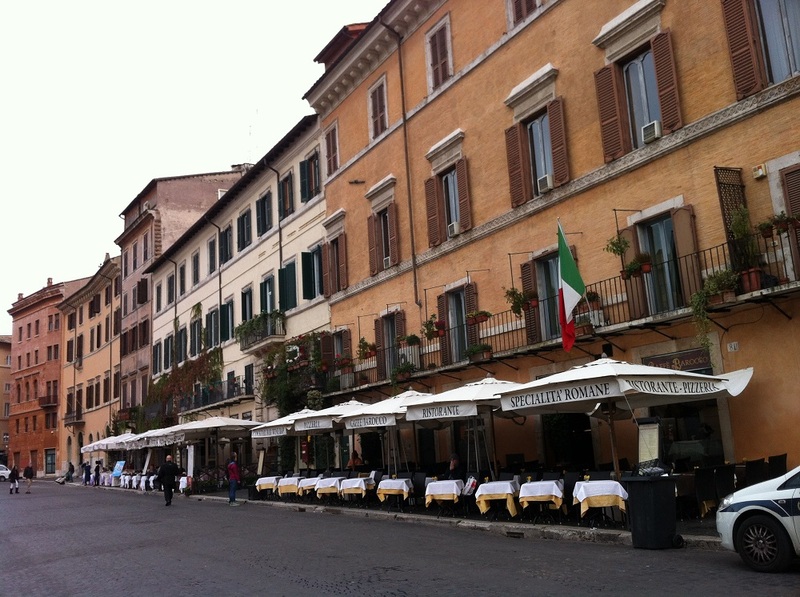 There are plenty restaurants and cafes serving delicious Italian food. 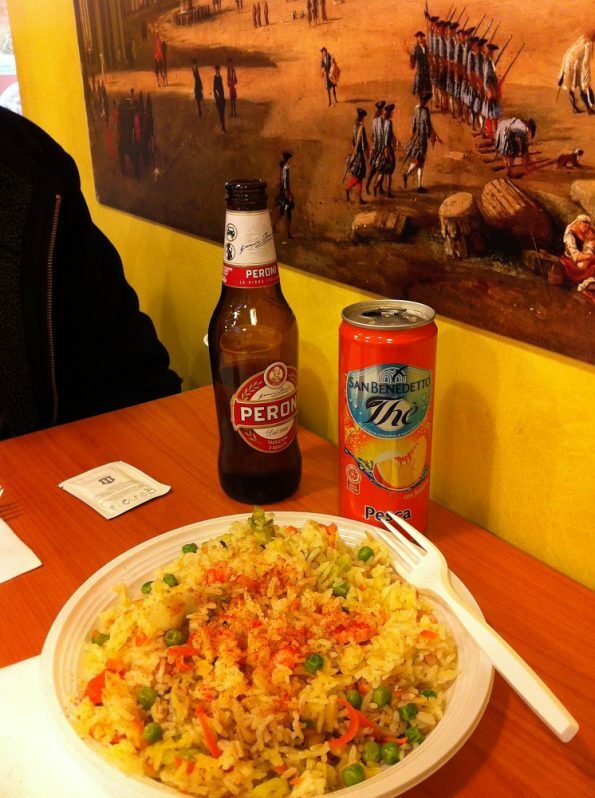 Interestingly there is also a local cafe selling (Chinese?) fried rice. 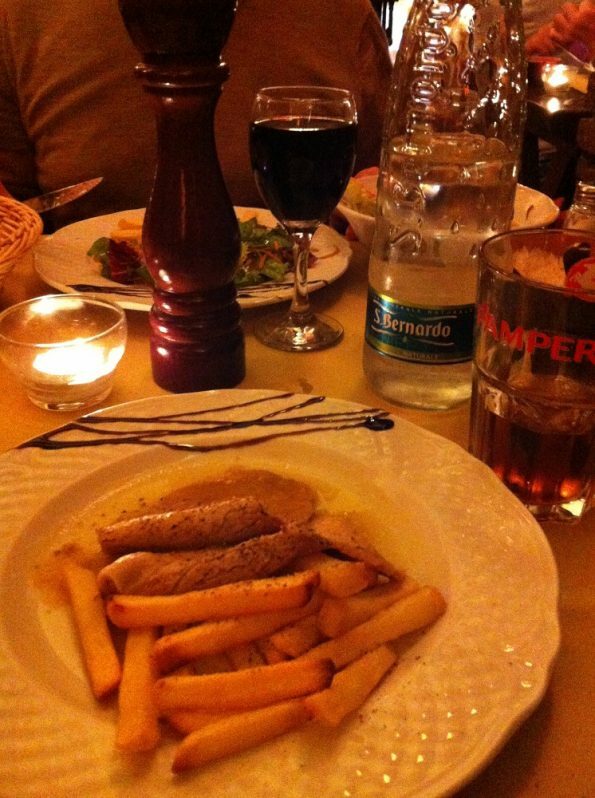 Chips and chicken: ehm.. is this Italian? 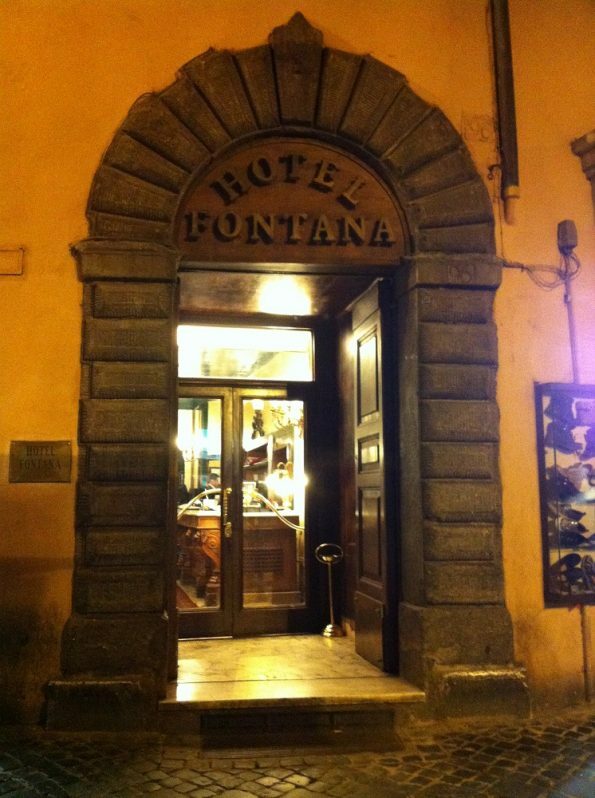 We stay at Hotel Fontana just across Trevi Fountain. 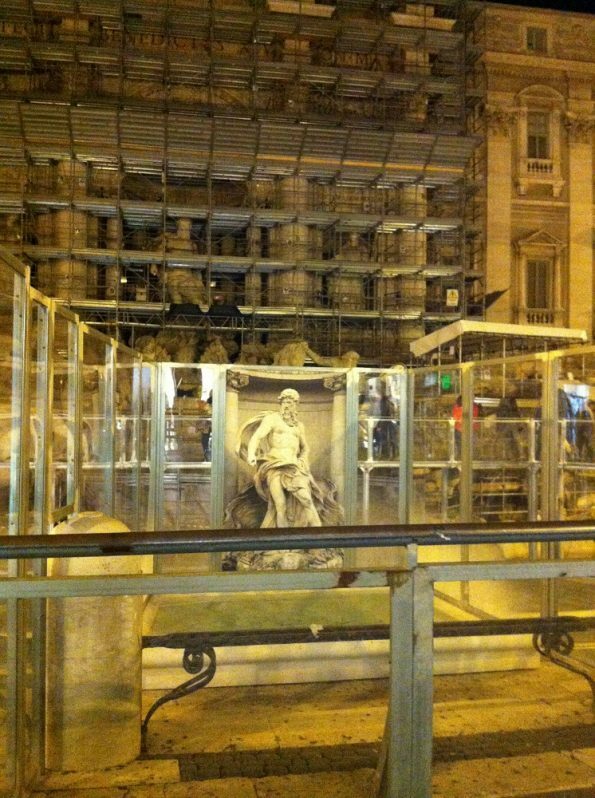 Unfortunately when we were there, the Trevi Fountain was undergoing a refurbishment. 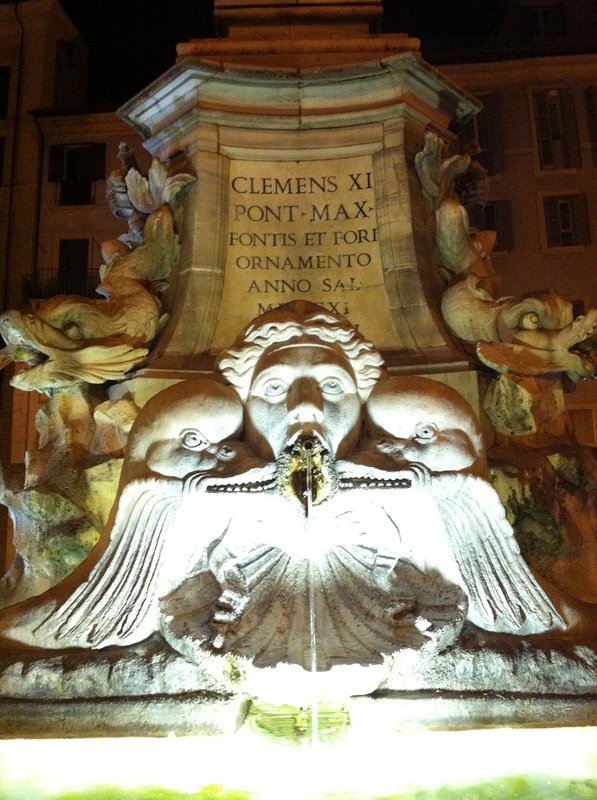 Therefore we did not see the glory of this marvellous 18th century baroque fountain. 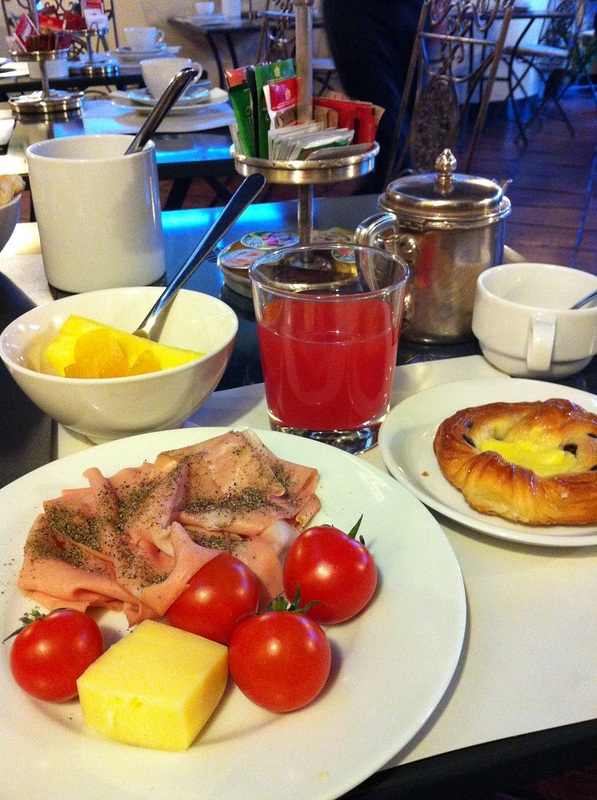 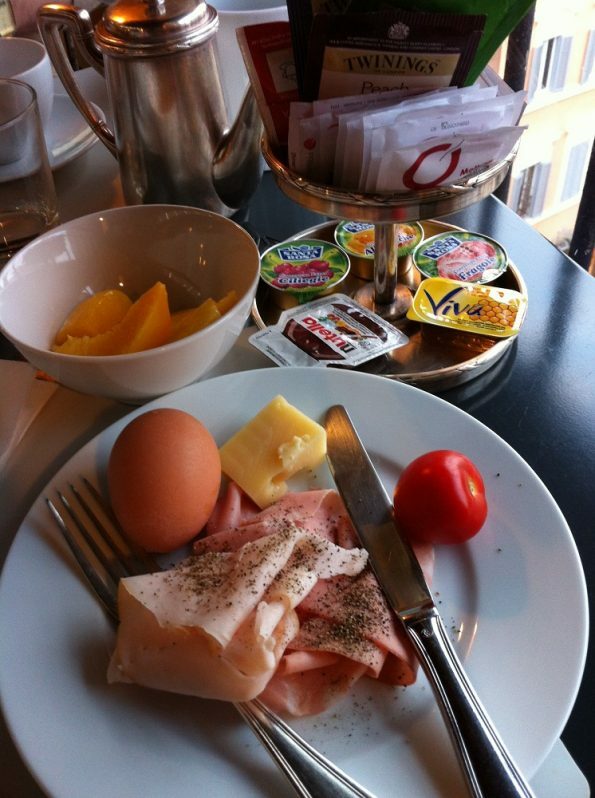 The breakfast at Hotel Fontana is so delicious. You can also see the Trevi Fountain from their breakfast room at the top floor. 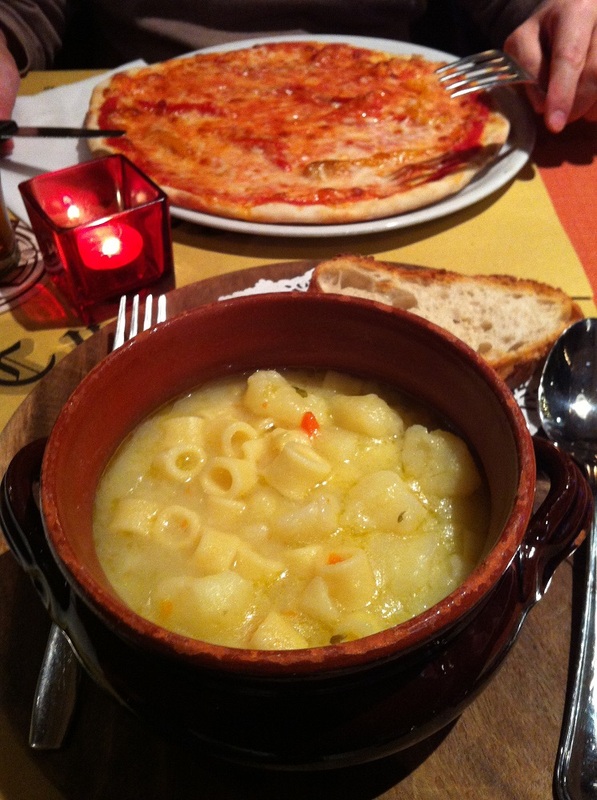 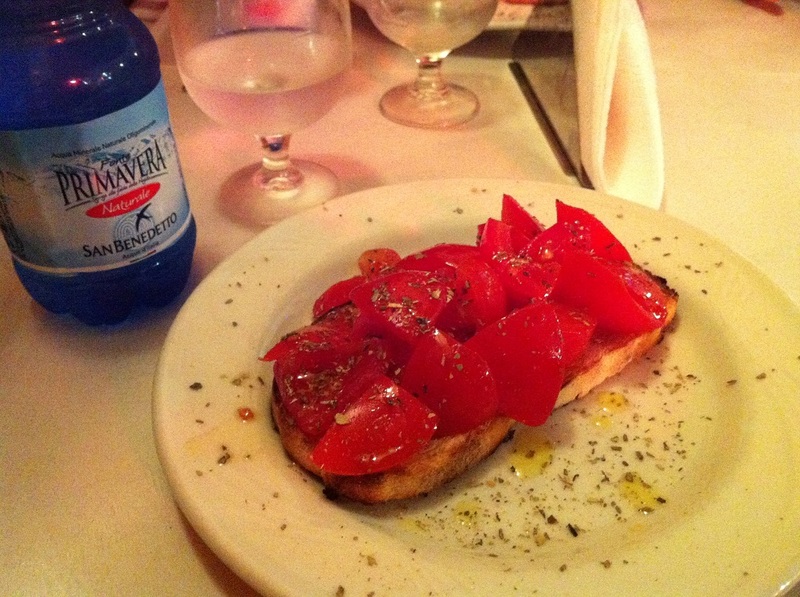 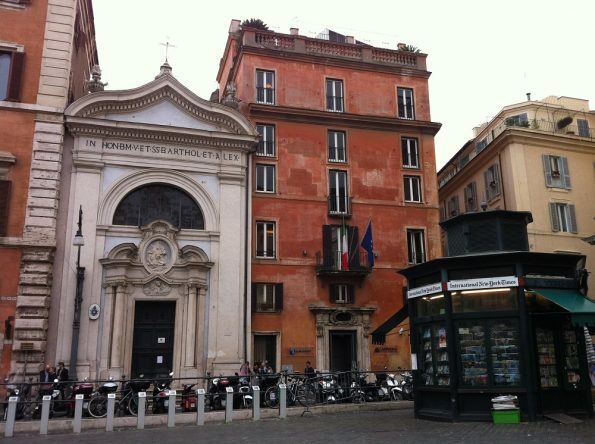 Not far from the Trevi Fountain, there is a lovely pizzeria ristorante with classic Italian atmosphere. 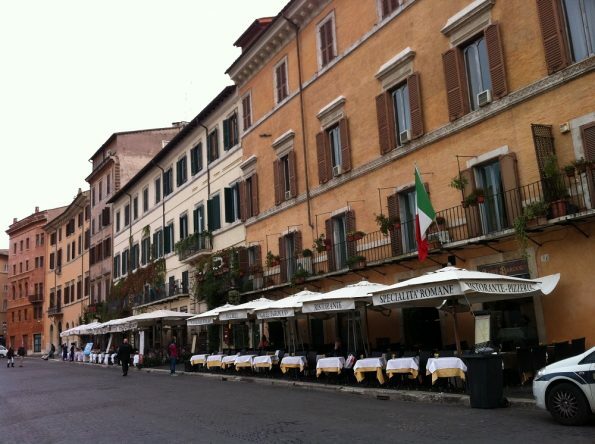 Look at the tablecloth! 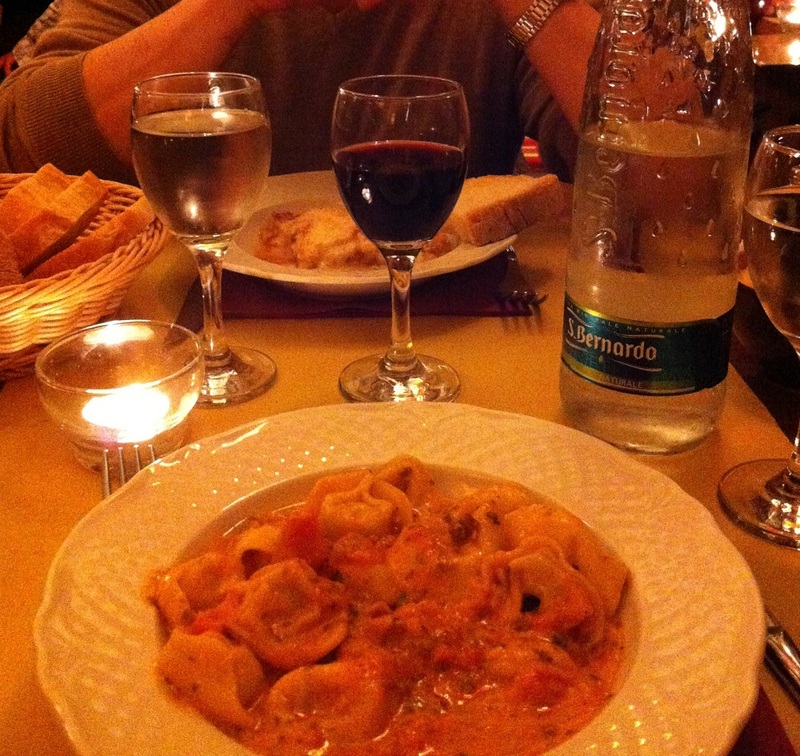 So Italian! 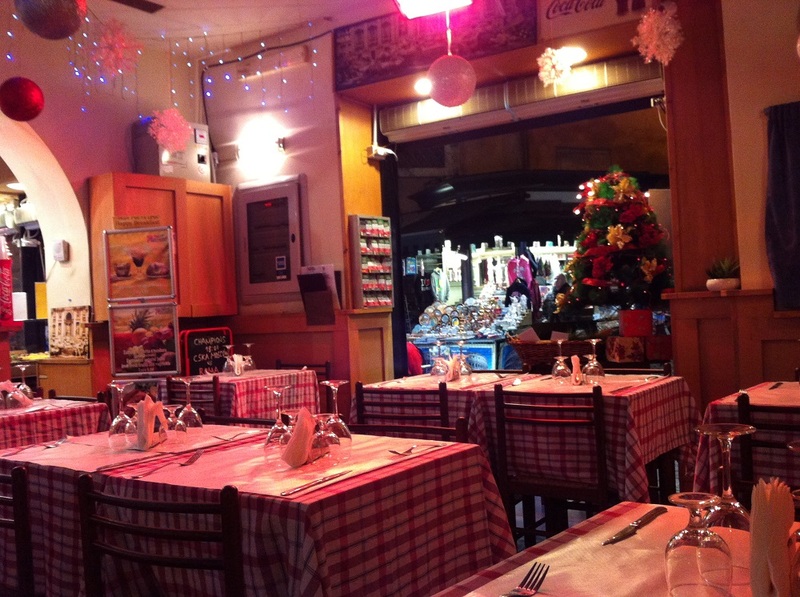 When we were there, it was during the festivity season, so the restaurant was beautifully decorated. 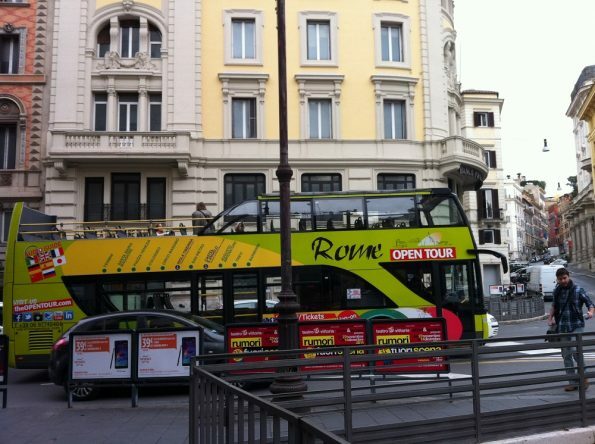 Rome Open Tour Bus, anyone? 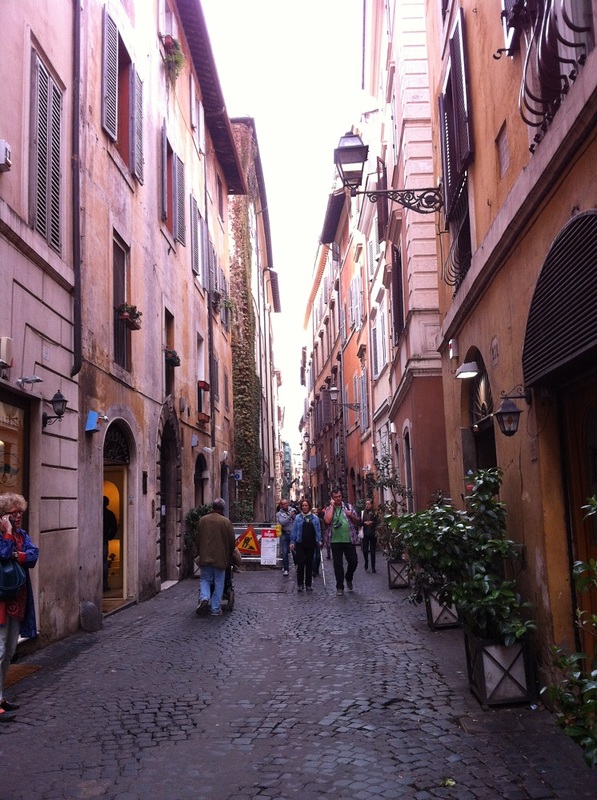 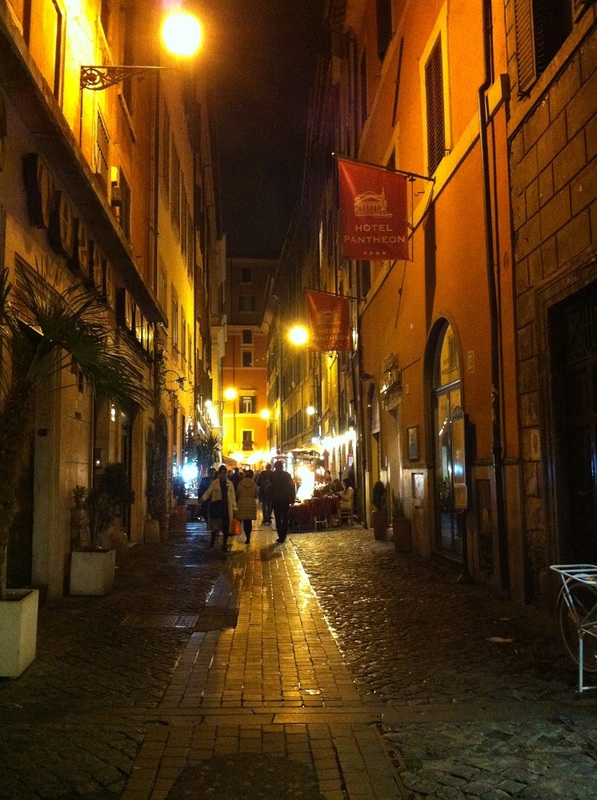 As with any Italian city, there are typical Italian narrow alleys all over Rome. Rome as the Italian capital is also a metropolitan city. 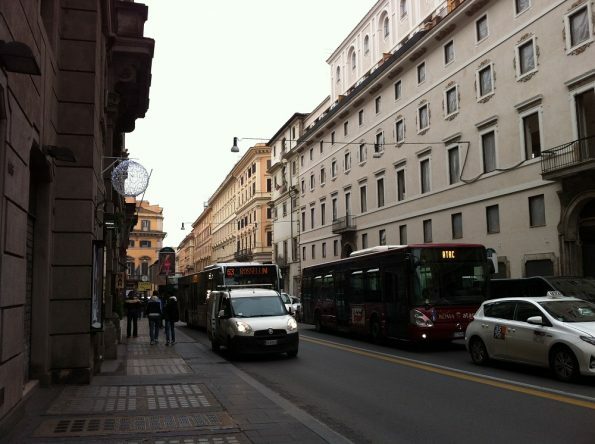 Expect traffic and busy street in Rome. Please also consider that Italy once one consists of various states of the Italian peninsula: Kingdom of Lombardy-Venetia, Kingdom of Sardinia, Kingdom of the Two Sicilies, Duchy of Tuscany, etc. 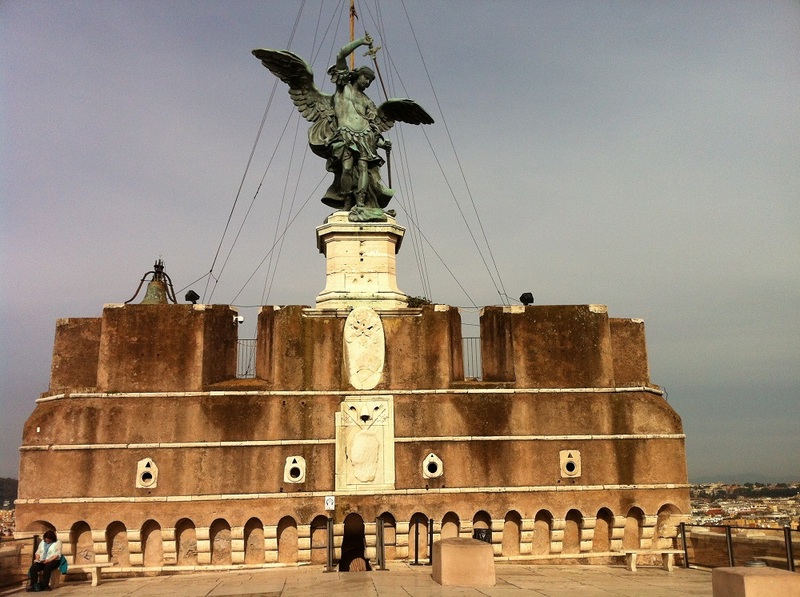 It is thus very interesting to see Italy transformed into a unified Italy with Victor Emmanuel II became the King of the unified Italy in 1861. 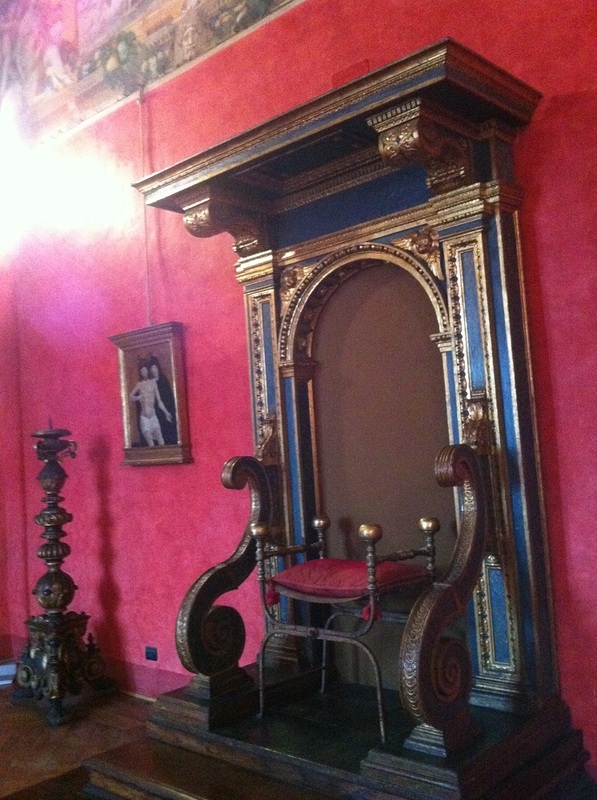 It is also interesting to see, from an antiques lover point of view, various types of antique with various coat of arms during the pre-unified Italy. Anyway, ciao now for my writing about Rome, and don’t forget to see more of my writing of other Italian cities on my website mariabristoll.com .